Ceasefire line between Syrian-controlled territory and the Israeli-occupied portion of the Golan Heights in 2004. The white buildings to the right belong to UN peacekeepers. For a war map of the current situation in Quneitra, see here. 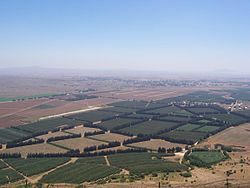 25 September 2012 El Rom, Golan Heights: Several errant mortar shells fired by the Syrian army fell in an agricultural land. 26 September 2012 El Rom, Golan Heights: A mortar shell fired from Syrian landed in the same location that was hit in the previous day. 5 November 2012 Golan Heights: An IDF jeep was hit by a bullet from Syria near the Syria-Israel border. No one was injured in the incident, but the vehicle was damaged. An IDF source said that it was errant fire by Syrian rebels. 8 November 2012 Alonei HaBashan, Golan Heights: three mortar shells hit the area. As part of its deployment, Israel deployed obstacles in the border area and reinforced the border fence. Israeli-Druze Deputy Minister, Ayoob Kara, said that opposition elements in Syria acknowledged their responsibility for the mortar shells that fell in the Golan Heights and expressed regret over the incident. Tel Hazeka, Golan Heights: A stray mortar shell from Syria's Quneitra Governorate landed near an Israeli military outpost. Quneitra Governorate: Israel responded with a "warning shot" by firing a single Tamuz anti-tank missile and released a statement warning further retaliation if the attacks persist. The FSA issued a statement, claiming that Israel hit FSA forces that were closing in on Damascus forces and negotiating their surrender, and warned against any further interference in the Syrian conflict in favor of Assad's regime. Quneitra Governorate: IDF's tanks fired on two D-3 mortar launchers belonging to the Syrian army, and confirmed a direct hit on the source of the fire. Tel Hazeka, Golan Heights: Syrian Army fire hit an IDF patrol near the DMZ, damaging one jeep; no injuries were reported. Quneitra Governorate: IDF fired artillery at the Syrian post in response. Israel confirmed a direct hit on the source of fire and said that Syrian soldiers may have been killed by the incident. Golan Heights: The Syrian Army retaliated by firing an additional mortar shell that landed in the demilitarized zone. 20 November 2012 Tel Hazeka, Golan Heights: An IDF jeep near a military outpost was hit by stray bullets fired from Syria. No Injuries occurred and the IDF did not retaliate. Golan Heights: Clashes between rebels and the Syrian army resulted in stray bullets striking near an IDF vehicle driving along the DMZ. No injuries or damage were reported, and Israel did not retaliate. Golan Heights: Israeli troops near the border were shot twice in the span of 12 hours by Syrian fire. No Israeli soldiers were hurt in the shooting, though IDF vehicles were hit. Quneitra Governorate: in retaliation, the IDF fired a Tamuz anti-tank guided missile against a Syrian machine gun nest, confirming a direct hit towards the source of the fire. Mount Peres, Golan Heights: a Syrian mortar landed near the area. There were no reports of injuries or damage. Tell Hazeka, Golan Heights: An IDF patrol on the border came under light fire from across the border. There were no reports of injuries or damage. Quneitra Governorate: IDF's tanks hit a Syrian military outpost. The IDF confirmed a direct hit. El Rom, Golan Heights: An IDF patrol in the Golan Heights came under artillery and small arms fire from Syrian Army forces. No injuries were reported, but damage was inflicted to an IDF vehicle. Quneitra Governorate: The IDF returned fire using tanks and Tamuz anti-tank guided missile towards a Syrian army outpost, close to where the patrol came under fire. The IDF claimed a direct hit on the source of the fire. 27 April 2013 Jamraya, Rif Dimashq: The Syrian rebels' military headquarters issued a statement claiming that Israeli wareplanes attacked the military research facility of the Syrian Scientific Studies and Research Center. 3 May 2013 Damascus: Israeli wareplanes attacked the Damascus International Airport. An Israeli official confirmed to Reuters that Israel is behind the attack. A Western intelligence source quoted by Reuters said that Israel targeted stores of Fateh-110 missiles that were in transit from Iran to Hezbollah. Al-Ma'atta, Damascus: according to a source in a Syria rebel unit in Damascus, Israel's F-16s attacked three times in Damascus. One of the attacks, he said, was carried out in the town of Al-Ma'atta, west of Damascus. 5 May 2013 Israeli warplanes attacked in and around Mount Qasioun, Al-Hamah, Qudsaya, Al-Sabboura, Jamraya, and al-Dimas, targeting a military facility and an arms depot of the 4th Armoured Division, warehouses of long-range missiles and bases belonging to the 104th and 105th Brigades of the Republican Guard, an ammunition warehouse belonging to the 14th Special Forces Division, a military research facility of the Syrian Scientific Studies and Research Center, al-Dimas Military Airport, and many others. 15 May 2013 Mount Hermon, Golan Heights: IDF positions were targeted by two mortar rounds that were fired by militants belonging to the "Abd al-Qadir al-Husayni Battalions" of the Free Palestine Movement. This was reportedly done in commemoration of Nakba Day. Golan Heights: an Israeli vehicle was hit by Syrian fire. Quneitra Governorate: Source of the attack was destroyed by Israeli fire. 5 June 2013 Two mortar shells exploded in an open area near the Syrian border in the Golan Heights, south of Majdal-Shams. The IDF investigated whether they fell on the Israeli or Syrian side of the border. Golan Heights: Several mortar rounds were fired from Syria and hit across the border, leading to a fire that broke out and ignited in the area where Israeli tanks were reportedly stationed. 17 July 2013 An Israeli army force on a routine patrol along the ceasefire line came under fire and shot back at a group of unidentified suspects on the frontier. There were no injuries among IDF soldiers. 27 July 2013 The Revolutionary Council of the rebels in Quneitra claimed that Israeli warplanes bombed a convoy of missiles on its way from Syria to Lebanon. The Revolutionary Command Council has published on its Facebook page that Israeli Air Force planes bombed Syrian army positions. Golan Heights: several Syrian mortar shells exploded in the Golan Heights. Quneitra Governorate: a Syrian army position was fired by the IDF using a guided missile. 21 October 2013 al-Jarida reported that the Israeli Air Force struck a shipment of advanced missiles in the Syrian-Lebanese border, preveting it from reaching Hezbollah. Sanawbar - Jableh, Latakia: Huge explosions hit a missile military base near the agricultural institute. Quoted eyewitnesses said there were no casualties, but that the base was severely damaged. The site was reportedly attacked by Israeli vessels from the Mediterranean sea. International outlets reported that the target was to hit P-800 Oniks reservoirs - an advanced naval missile capable of hitting targets at close range, 300 km, while other sources claimed that the target was SA-125 surface-to-air anti-aircraft missiles. Al-Arabiya reported that Israel targeted SA-8 missiles. An US government official confirmed that Israel was behind the attack and that the targets were missiles and equipment that Israel feared Syria might transfer to Hezbollah. US officials quoted by AFP confirmed the Israeli airstrike, and claimed that the target was SA-125 missiles. Damascus: Al-Arabiya reported that Israel attacked and destroyed SA-8 missiles, which were supposed to reach Hezbollah. Ain Shikak: A Syrian opposition source quoted by Reuters said that Israel struck a strategic missile battery near a village called Ain Shikak where Assad's long-range Russian missiles were kept. 14 November 2013 Sources of the FSA's intelligence reported that an Israeli drone bombarded a convoy of the Free Syrian Army which was on its way to the Qalamoun region. The convoy was reportedly loaded with ammunition which was looted from Mahin's warehouses. 6 December 2013 Golan Heights: Israeli military vehicle had been damaged by a bomb set off by Syrians on the Syrian side of the frontier fence. 26 January 2014 Latakia: an explosion took place in the Sheikh Dahar neighborhood, near the port of Latakia, allegedly by Israeli warplanes targeting S-300 missile launchers. 1 March 2014 Mount Hermon, Golan Heights: Two rockets were fired at an Israeli position, in what is reportedly a retaliation for an Israeli airstrike on a Hezbollah target near the Lebanese-Syrian border. 5 March 2014 The Israeli army shot 3 Hezbollah fighters who tried to plant a bomb on the fence between the Israeli-controlled Golan Heights and Syrian-held territory. Golan Heights: An explosive device was detonated close to an Israeli jeep near the Syrian border. One soldier was seriously wounded. Another three soldiers sustained light-to-moderate injuries. This occurred a few days after a similar incident on the Israeli-Lebanese border when another explosive device targeted an Israeli jeep and Israel responded with artillery and tank fire towards Lebanon. Israel blamed Hezbollah for both incidents. An IDF 155mm artillery battery returned fire, firing several shells at a Syrian outpost. Israel further responded by carrying out multiple airstrikes against Syrian targets, including a military headquarters, artillery batteries and a Syrian army training base. The Syrian army reported that the Israeli airstrikes killed one Syrian soldier and wounded seven. Mount Hermon, Golan Heights: Syrian shells flew in the direction of Israeli military positions. No injuries or damage have been occurred. Quneitra Governorate: the IDF responded with artillery salvos toward the sources of fire. 4 June 2014 Golan Heights: two mortar shells were fired from Syria into Israeli territory. The Iron Dome missile defense system was activated for the first time in northern Israel to intercept the two shells. At least two intercepting missiles were fired towards the Syrian ceasefire line, but were "called off" in-flight by the Iron Dome's operators when it became clear the shells were going to fall in open fields. The falling shells caused fires in several spots in the area, but firefighters called to the scene and put out the fires. 22 June 2014 Golan Heights: an anti-tank missile was fired across the border from Syria at a water truck moving along the border fence. A 14-year-old boy, the son of the contractor driving the truck, was killed and 3 other Israeli civilians were injured from the blast. Quneitra Governorate: the Israeli military launched several airstrikes targeting Syrian troops in retaliation for the attack. At least ten Syrian soldiers were killed during the strikes. Golan Heights: a mortar shell launched from Syria hit the Golan Heights, causing no injuries or damage. Quneitra Governorate: the IDF responded by firing at suspicious positions on the Syrian side of the border. 13 July 2014 Golan Heights: a rocket landed in an open area. No injuries or damage were reported. The IDF reported that the rocket was deliberately fired from Syria at Israel. Golan Heights: a rocket hit the area. Baath City / al-Kawm, Quneitra: in retaliation, Israeli warplanes struck three targets in Quneitra area. UK-based SOHR reported that Israeli warplanes struck the headquarters of the 90th Brigade and the Baath City, where the Syrian government's headquarters and administrative centers are located. SOHR reported that the Israeli attack killed 4, two guards and two women, and injured 10 others. Turkish-based Daily Sabah, quoted a Syrian opposition claiming the killing of 18 Syrian, including eight civilians and ten soldiers. 24 August 2014 Golan Heights: Five rockets from Syria landed across the border in open areas and no injuries were reported. Golan Heights: Three errant mortar shells fired from Syria hit the Golan Heights, wounding an Israeli officer and causing damage to a pair of vehicles. An Israeli civilian was lightly injured. Quneitra Governorate: The IDF responded with artillery fire against a Syrian army position. 31 August 2014 Golan Heights: The IDF shot down a drone that entered Israeli air space from the Quneitra region in Syria. Army sources said the drone likely belonged to the military of the Syrian government, and strayed into Israeli airspace by accident. After the remains of the drone were recovered by Israeli security forces, Israeli officials said that the drone was an Iranian-made Yasir model. 2 September 2014 Golan Heights: There were a number of small-scale shooting on journalists who came to cover the Syrian side of the border in the Quneitra area. There were no casualties and no damage was done. An Israeli military source estimated that this was not deliberate fire but rather machine-gun fire by the Syrian army against the rebel forces, which leapt into Israeli territory. Golan Heights: a rocket hit the Golan Heights. Quneitra Governorate: in retaliation, the IDF fired a missile at a Syrian army position. 23 September 2014 Golan Heights: Israel shot down an errant Syrian jet fighter that had strayed over the Golan Heights. Al-Dimas, Rif Dimashq: Arab media reported that Israeli jets attacked three targets at or near al-Dimas military airbase and Damascus International Airport. Some reports stated that the Syrian troops fired back a surface-to-air-missile at an IAF aircraft following the raid. Syrian military sources claimed that their air defense units had been able to down an Israel drone that had taken part in the raid. Lebanese Al-Mayadeen reported that the planes launched 10 bombs. al-Kawm, Quneitra: Israeli jets struck the 90th Brigade. 18 January 2015 Mazraat Amal, Quneitra: a cell of the Hezbollah's fighters was attacked by Israel. Hezbollah's Al-Manar TV channel confirmed that several of its fighters had been killed in the air force attack, including Jihad Mughniyah. 27 January 2015 Golan Heights: two projectiles fired from Syria landed in the Golan Heights without causing injuries or damage. Quneitra Governorate: the IDF returned artillery fire toward the source of the projectiles, claiming direct hits. 31 February 2015 Homs Governorate: A security source of the Syrian government quoted by Arabi21 said that Israel struck warehouses of the 18th Armoured Division, resulting in the complete vanishment of the warehouses and the soldiers who inhabited them. Golan Heights: An IDF officer was slightly injured near the Syrian border by small arms fire from Syria. The officer did not need medical treatment. Quneitra Governorate: IDF returned fire at the source of the shooting. Alonei Habashan, Golan Heights: An apparent stray mortar shell landed in an open area and there were no casualties. 27 April 2015 Qalamun Mountains: Arab news networks al-Jazeera and al-Arabiya reported that Israel targeted missile launchers held by Hezbollah and forces loyal to Syrian President Bashar Assad. Citing reliable sources, Israeli Ynet reported that the explosions were the work of the Al-Nusra Front militant group fighting the Assad regime, and not Israel, adding that the group "is apparently trying to make psychological gains that would lead to the departure of the Syrian army and Hezbollah from the region, making them believe that Israel is launching strikes there, and taking advantage of the alleged previous Israeli assault." On the other hand, Syrian opposition factions announced on social media that they were responsible for the attack on the Syrian missile base, claiming that they have four units stationed in the Qalamoun region who fired some 30 Grad rockets at the base. 28 April 2015 Ein Zivan, Golan Heights: An alarm sounded at 12:00 in the Golan Heights. Civilians in the Golan reported hearing explosions, apparently two hits in the orchards of Kibbutz Ein Zivan. Troops scanned the area. Golan Heights: At 11:46, an alarm sounded in northern Golan Heights: Ortal, Aloni Habashan, Merom Golan, Ein Zivan and Keshet. The IDF spokesman reported that security forces had scanned the area, but that no hits had been identified at this stage. Apparently, mortar shells exploded on the Syrian side of the border, a few meters from the perimeter fence. Al-Sanamayn, Daraa: The Syrian Army's 150th regiment, destroying its missile bases and air defense vehicles. Syrian opposition elements accused Israel that it tried to prevent the rebels from seizing control of the advanced weapons and equipments. Khalkhalah, As-Suwayda: Khalkhalah Military Airport. 21 June 2015 Saghbine, Beqaa Valley: Al Jazeera reported that Israeli jets attacked targets in the mountainous areas. However, Hezbollah-affiliated Al-Manar reported that an Israeli drone crashed in the area, and that later an Israeli aircraft fired on it and destroyed the downed drone. 23 June 2015 Majdal Shams, Golan Heights: several dozen Druze from the village attacked an Israeli military ambulance evacuating two wounded Syrians from the neutral zone. The attack was reportedly motivated by a rumor that the ambulance evacuated jihadist fighters from Syria. The attack on the ambulance resulted in the beating to death of one of the wounded Syrians, and the other's deterioration into a critical condition; an Israeli officer and a soldier were also wounded in the incident. The attack was reported by the media as a "lynch" by Druze mob, but drew a praise from the Syrian state media, who defined the act as "heroic". The Prime Minister of Israel consequently pledged to track down those responsible for the act and bring them to justice. The attack was also condemned by the Israeli Druze leader, Sheikh Muafak Tarif, who said that an emergency meeting of religious and secular Druze leaders "strongly condemned" the ambulance attack, calling it "a deplorable act committed by outlaws". 28 June 2015 Golan Heights: Rocket alert sirens sounded twice in 30 minutes. The IDF said the sirens were triggered by internal Syrian battles between rebel groups and Assad forces. 8 July 2015 Jubata al-Khashab, Quneitra: Syrian activists reported that elements of the Israeli army entered with several armored vehicles into the al-Shahaar refugee camp near the border strip between Quneitra region and the Israeli-controlled Golan Heights. Quoted eyewitnesses said that the Israeli army instructioned the displaced people to evacuate, and destroyed the tents of the residents, and that afterwards the Israeli army returned with their vehicles beyond the border. 29 July 2015 Hader, Quneitra: The Lebanese Al Mayadeen network, which is affiliated with Hezbollah, reported that Israel attacked a vehicle, killing three members of the popular committees, militias identified with Syrian President Bashar. The Al-Manar network, which belongs to Hezbollah, claimed that an Israeli drone carried out an attack and killed two people. Other reports claimed that five people were killed, including members of Hezbollah. Golan Heights: Two mortar shells exploded in an open area in the northern Golan Heights, and one woman was lightly injured. The mortar shells exploded in the orchards near the border, and are apparently a spillover of the Syrian Civil War. 20 August 2015 Four rockets struck the Israeli-controlled Golan Heights and Upper Galilee. Security sources said the Islamic Jihad organization was responsible for the rocket fire, with the financial backing and the direction of Iran. Furthermore, Israel said that Syria was also responsible and "will suffer the consequences". al-Kawm, Quneitra: The 90th Brigade's base. Tal al-Sha'ar, Quneitra: Syrian army's reconnaissance forces stationed in the area. Baath City, Quneitra: Syrian army's artillery battalion, and the fire station. The 137th Brigade in the western suburbs of Damascus. Khan al-Shih, Rif Dimashq: The 68th Brigade's base. Fars News Agency reported that the Syrian air defense system shot down an Israeli warplane violating Syiran airspace. 21 August 2015 A day after four rocket struck the Golan Heights, the IDF launched an additional airstrike on a vehicle, killing 4-5 allegedly Iran-backed Islamic Jihad militants who were believed to be the perpetrators of the initial attack on Israel. The Syrian government refuted this report, claiming that the attack killed five civilians. 26 September 2015 Golan Heights: a rocket hit the Israeli-controlled Golan Heights without causing any injury or damage. The Israeli military did not retaliate. 27 September 2015 Golan Heights: a rockets hit the Israeli-controlled Golan Heights without causing any injury or damage. Quneitra Governorate: The Israeli military said that they hit two Syrian military installations in response to errant mortar fire launched from Syria that has landed in Israel in the past two days. RCC spokesman Abu Ali al-Jawlani confirmed that Israel targeted at least three government-held military with three missiles. UK-based SOHR reported that Israel fired at least 3 rockets against the a military company which belongs to the 90th Brigade of the Syrian Army. 30 October 2015 The Lebanese and Syrian media reported that Israel Air Force warplanes have attacked targets in Syria linked to Hezbollah, in the Qalamoun Mountains region of western Syria, in the Damascus area, and in southern Syria. Ras al-Ayn, Rif Dimashq: Syria Mubasher, an opposition-affiliated news site, reported that Israeli warplanes struck a military facility. Israel reportedly targeted two Hezbollah positions between Ras al-Maara and Ras al-Ayn, one of which was a weapons shipment headed to reach Hezbollah. Al-Qutayfah, Rif Dimashq: Israeli wareplanes launched sixteen rockets against three warehouses containing Scud missiles at the 155th Brigade base. 1 November 2015 Al-Qutayfah, Rif Dimashq: Media outlets affiliated with the Syrian rebel groups reported that the Israeli Air Force attacked the 155th Brigade's three Scud missile stores at the border area, between Syria and Lebanon, which is used for weapons smuggling by Hezbollah. 11 November 2015 Damascus: Syrian opposition groups reported that weapons shipment intended for Hezbollah near Damascus International Airport were targeted by Israeli jets. 23 November 2015 Qalamun Mountains: The Syrian opposition reported an Israeli airstrike in the Qualamoun area of the Syria–Lebanon border. According to these sources, the strike killed 13 Syrian troops and Hezbollah fighters, and left dozens wounded, including four seriously. 26 November 2015 Flitah, Rif Dimashq: Israel fired three strikes on Hezbollah positions on the hillside of Flitah, forcing them to withdraw to town of Flitah. 4 December 2015 Syrian media reported that Israel attacked in the Qalamun Mountains near the Syrian-Lebanese border, and shortly afterwards bombed the 155th Brigade in the Al-Qutayfah area. According to other reports, the Israeli Air Force struck northeast of Damascus and destroyed trucks carrying ballistic missiles at the 155th base and on the road leading to Beirut from Syria. 26 December 2015 Qalamoun Mountains: Syrian sources reported that Israel attacked at least 7 Hezbollah targets. Hezbollah denied any explosions at its bases. 11 January 2016 Flitah, Rif Dimashq: Syrian opposition sources reported that Israeli aircraft conducted as much as five strikes against Hezbollah targets. A subsequent report added that ambulance sirens were heard in nearby town Yabroud after the alleged strikes. Al-Qutayfah, Rif Dimashq: Syrian sources reported that Israel attacked the 155th Brigade's Scud missile base and a Hezbollah military base on the Syrian-Lebanese border. Hezbollah-affiliated Al-Manar denied the reports. Al-Ruhaybah, Rif Dimashq: Reports claimed that Israel attacked Syrian army warehouses. 17 February 2016 The UK-based Syrian Observatory for Human Rights reported that three Israeli rockets had hit Syrian army outposts south of Damascus. 10 May 2016 Anjar, Beqaa Valley: Israeli Air Force attacked a Hezbollah convoy which included six vehicles near the village as it made its way from Syria to Lebanon in the Qalamoun Mountains on the border with Syria. 6 June 2016 Shinshar, Homs: Zaman al-Wasl reported that the Israeli Air Force conducted raids against fortifications related to the fourth mechanical battalion of the Syrian army. 7 June 2016 Al-Qutayfah, Rif Dimashq: Arab sources reported that Israeli Air Force bombed an ammunition warehouse inside a 19th Brigade's military base, destroying an ammunition intended for Hizbollah. Golan Heights: Errant fire from fighting in Syria's civil war struck the Israeli-controlled Golan Heights. Tel Shaar, Quneitra: In response, the Israeli Army struck two targets belonging to the Syrian military in Quneitra. A Syrian source quoted by Tasnim News Agency said that Israel fired two rockets that hit near a Syrian army position. Baath City, Quneitra: Israel struck a perceived weapons warehouse which local sources reported was an empty workers housing facility that had no Syrian military presence. A Syrian source quoted by Tasnim News Agency reported that an Israeli helicopter struck an unfinished building, leading to its collapse. Golan Heights: Syrian eyewitnesses qutoted by Al Khaleej Online said that Syrian mortar shells fell in the Israeli-controlled Golan. Baath City, Quneitra: Local sources claimed that Israel conducted three airstrikes against a building belonging to the Syrian government forces and the Iranian-support groups. Al Khaleej Online, citing private sources, reported that Israel targeted a military security center of the Syrian government, and that the bombing resulted in many deaths and injuries in the center. Al Khaleej Online reported that according to preliminary information, the targeted center includes a headquarters for joint operations between the forces of the Syrian government and the Lebanese Hezbollah leadership in the region. A senior Syrian official quoted by a German news agency said that an Israeli aircraft had fired a missile at a Syrian position, killing a civilian and wounding three soldiers. The Lebanese Al-Mayadeen news agency, however, denied the accuracy of reports attributing the bombing to Israeli airstrikes in Syria, quoting Hezbollah saying the al-Qaeda affiliated Nusra Front launched rockets at Quneitra, inflicting casualties. Golan Heights: Mortars exploded on the Israeli-held territory. Baath City, Quneitra: Two military outposts belonging to the Syrian army were targeted by the Israeli Army. Golan Heights: A Syrian mortar shell landed in an open area near the security fence and an outpost on the Israeli-controlled Golan Heights. Quneitra Governorate: The Syrian mortar launchers were attacked in response by the IDF. Golan Heights: A Syrian mortar shell fired from Syria landed on a road. Mashati, Quneitra: Syrian artillery launchers were attacked in response by the IDF. 7 September 2016 Golan Heights: Syria mortars landed on the Israeli-controlled area. No damages or injuries were reported. 8 September 2016 Golan Heights, Quneitra: Mortars in the Syrian-controlled northern Golan Heights were attacked in retaliation of the Syrian mortars landing on Israeli-controlled area in the day. Golan Heights: A mortar shell landed in the northern area. Quneitra Governorate: Syrian army mortar launchers were attacked by the Israeli Air Force. 12 September 2016 Golan Heights: in an apparent case of spillover fighting of the Syrian civil war, a mortar shell was identified in the northern area. No casualties or damage was reported. 17 September 2016 Golan Heights: The Iron Dome system recorded a first interception in the Golan Heights sector when it intercepted a high-trajectory fire from Syria. It is unclear whether the threat that was intercepted was a mortar shell or an artillery rocket. About two hours after the interception, another interception took place. Khan Arnabah, Quneitra: An Israeli drone attacked artillery positions manned by Syrian Army. At least one soldier was killed in the attack and several others wounded. Golan Heights: A mortar shell fired from Syria landed in the Israeli-controlled area. Quneitra Governorate: A Syrian artillery was attacked by the IDF in response.In response, the IDF attacked a Syrian artillery battery. 28 November 2016 Quneitra Governorate: Israel struck an abandoned United Nations building that was suspected of being used as a base by ISIS militants. The facility was controlled by the Khalid ibn al-Walid Army, which is part of ISIS. 29 November 2016 Golan Heights: Rocket sirens were heard in the Golan, and the residents were instructed to enter into protective shelters. A short time later the IDF Spokesperson stated that no mortar shells had been found in Israeli territory, and that this was apparently a false alarm. 8 February 2017 Golan Heights: A mortar shell fired from a tank in Syria exploded in open territory. Baath City, Quneitra: In retaliation, an Israeli helicopter attacked Syrian military structures. Golan Heights: Israeli Defense Forces aircraft were reportedly targeted by several Syrian S-200 missiles above the Western Golan Heights, and one missile was shot down by an Arrow 2. Israel denied Syria's claim that one jet fighter was shot down and another damaged. 20 March 2017 Syria media reported that Israeli jets took out a number of targets near the Lebanon-Syria border including a Hezbollah weapons convoy and Syrian military sites. 21 March 2017 Hader, Quneitra: An IDF's Skylark I drone ("Sky Rider" in Hebrew) fell while it was on a mission. Hezbollah claimed to have shot down the drone, and later the Syrian Defense Ministry released a statement saying that its air defense unit had shot down the drone. The IDF's Spokesperson's Unit denied the reports that the drone had been shot down. Golan Heights: Three mortar shells from Syria landed in the northern area. Quneitra Governorate: In retaliation, the Israeli army attacked positions affiliated with the Syrian government. Golan Heights: Three mortar shells landed in the Israeli-controlled Golan Heights. and the IDF responded by firing at Syrian positions. Quneitra Governorate: Syrian positions were fired in retaliation by the IDF. 27 April 2017 Damascus: Israel warplanes targeted a weapons hub, containing arms sent from Iran to Hezbollah, located near the Damascus International Airport. Golan Heights: The IDF fired a Patriot missile towards a drone that penetrated into Israeli airspace, and successfully downed it. Initially it was not clear if the aircraft was Russian or Syrian, but the Israeli army later confirmed that it was Syrian. 29 April 2017 Damascus: Arab media and Syrian opposition forces reported that the Israeli Air Force struck Syrian Army forces. Al Mayadeen network quoted Syrian army officials who denied an attack had taken place. Al-Hamdiyah - Abu Shabta, Quneitra: An Israeli drone reportedly conducted numerous strikes in the province, leading to the death of three SAA soldiers. The Syrian Air Defense Force promptly opened fire and downed the drone over rebel-held territory. Hezbollah-affiliated Al Mayadeen denied the reports of an Israeli attack and claimed that the Syrian soldiers were killed in battles with rebels near the town of Al-Hamidiya. Golan Heights: Syrian projectiles hit the Israeli-controlled Golan Heights. Quneitra Governorate: Israeli military targeted two artillery positions and an ammunitions truck belonging to the Syrian government, in response to the projectiles. Golan Heights: Israeli media reported there had been a leakage of mortar shells from Syria towards the northern Golan Heights. However, The IDF Spokesperson's Office clarified that there had not been a leakage of mortar shells, and that surveys in the fields indicate that individual machine gun bullets hit the UNDOF camp in Ein Zivan, near the fence in the northern Golan Heights. As a result of the bullets, a fire broke out in a nearby minefield. Quneitra Governorate: The Israeli Air Force struck Syrian army positions at the Mafrazeh Al-Jisr Checkpoint in the Golan Heights, killing 2 soldiers and wounding three others. Another Israeli airstrike was reported at the village of Ayn-Aysha. 27 June 2017 Damascus: The Syrian state media reported that the Israeli jets targeted Syrian military position southwest of Damascus International Airport. Golan Heights: A a stray mortar shell hit an open area in the Israeli-controlled northern Golan Heights, causing no injuries. Samadanieh al Sharqiyah, Quneitra: The Israeli army attacked a Syrian military position, in retaliation for the stray mortar. Golan Heights: Two Syrian hits were identified in the northern Golan Heights, near the border fence. Quneitra Governorate: A Syrian-made cannon belonging to the Syrian government was attacked in retaliation by the Israeli army. 4 July 2017 Israeli jet, believed to be a drone, fired a missiles on a position of Syrian government forces and their allied militiamen in the northern sector of Al-Quneitra countryside. 7 September 2017 Masyaf, Hama: the Syrian Army reported that Israel attacked the Syrian Scientific Studies and Research Center. 19 September 2017 An Iranian unmanned aircraft from Hezbollah entered the demilitarized zone near the Golan Heights and was shot down by the air defense system using a MIM-104D Patriot air-to-air missile. 22 September 2017 Damascus: Reports claimed that Israel Air Force struck Hezbollah weapons depot near the Damascus International Airport. 26 September 2017 al-Kawm, Quneitra: Syrian sources reported that an Israeli aircraft launched raids on the 90th Brigade's base. Hezbollah-affiliated Al Mayadeen quoted local sources who denied an Israeli attack on the 90th Brigade, and who claimed that the sound of explosions was caused by a Syrian aircraft avoiding interception by an Israeli missile. Another source quoted by Al Mayadeen, claimed that the Israeli missile's explosion caused fires in the area where it fell. 10 October 2017 Golan Heights: Small arms hit near a field clinic which operates in the framework of the "Operation Good Neighbor", and close to the border (in an enclave) in the southern Golan Heights. As a result of the stray shooting, A foreign national doctor, who works in the clinic as a medical staff member, was lightly wounded and was treated at the site. 16 October 2017 Israeli forces attacked an anti-aircraft battery in Syria. 19 October 2017 A rocket from Syria landed in the Golan Heights. The IDF responded by attacking the a Syrian army position. 21 October 2017 Israeli forces struck three Syrian artillery positions after five projectiles were launched towards Israel. Three of the five projectiles landed in open territory in northern Golan Heights, causing no damage or injuries. According to Syrian Government sources, the attack from Syria came "after terrorists linked to Israel had launched mortar shells, upon the instructions of the Israeli occupation, on an area of empty land inside the occupied territories to give the Israeli enemy a pretext to carry out its aggression." 1 November 2017 Hisyah, Homs: Israeli warplanes targeted a Syrian military or Hezbollah installation that was believed to manufacture rockets. Pro-government sources claimed that the target was a storage warehouse in an industrial complex or a copper factory. Hader, Quneitra: On the morning, Tahrir al-Sham and allied Free Syrian Army launched a large scale offensive against the government forces in Hader, in order to break the siege of the nearby Beit Jinn opposition pocket. This was reportedly done with direct artillery support from the Israeli Defense Forces (IDF). A quoted local resident said that all the people in the town saw how Israel helped Al-Nusra Front by covering them with live fire from the hilltops to help them take over town. Majdal Shams, Golan Heights: A Druze resident was slightly injured by small arms fire from Syrian territory. Subsequently, a large number of Druze residents of the Golan began to protest against the rebel's offensive on the predominantly Druze village, Hader. In response, the IDF spokesman said: "In the light of the escalation of fighting in Hadar, Israel has not helped and will not support any terrorist organization to touch the inhabitants of the village. On the contrary, we will continue to stand by the Druze in the Golan Heights". Trinjeh, Quneitra: Syrian sources reported that Israel began shelling rebel positions after the rebel's assault reached towards the Druze village of Hader. The FSA groups announced that they were forced to retreat after Israeli forces intervened on the side of pro-Assad militias by targeting the reinforcements the FSA groups sent to the border strip of land in southwestern Syria. On the other hand, Israeli researcher Elizabeth Tsurkov claimed that the reports of Israeli shelling on the rebels were nothing more than false rumors. 11 November 2017 The IDF's air defense system dropped an unmanned aerial vehicle in the northern Golan Heights before it was able to cross the border into Israel. The aircraft was shot down by a MIM-104D air-to-air missile Patriot. 13 November 2017 Al-Mula'il - Al-Rafid, Quneitra: Fighters from the Free Syrian Army factions and a group of youths ambushed three armored Israeli vehicles, trying to rob an humanitarian aid shipment. The Israeli army promptly struck the group with anti personnel missiles. No injuries were recorded. 18 November 2017 Ayn al-Tineh, Quneitra: The Israeli army fired a warning shot towards the area by a tank. The Israeli army issued a statement, claiming that the forces of the Syrian regime ""violated the cease-fire signed in 1974, through the construction work aimed at strengthening a military center in the northern part of the demilitarized zone". 19 November 2017 Qers al-Nafl, Quneitra: A day after the IDF fired a warning shot due to Syrian regime's violation of the cease-fire agreement, the IDF's artillery fired "warning shots" and the army issued a similar statement. However, the Israeli statement this time indicated that it had filed a complaint with the United Nations Disengagement Observer Force (UNDOF), which monitors the cease-fire line. 28 November 2017 Daraa Governorate: Opposition groups, aided by limited Israeli air support, had launched a major offensive codenamed “The People of the Land” against the Islamic State-affiliated Jaish Khalid Ibn al-Walid. The rebels made minor advances on the Tasil front, but later the Islamic state quickly reversed all the rebels' gains in a counterattack. 4 December 2017 Jamraya, Rif Dimashq: Reports claimed that Israel targeted the military research facility of the Syrian Scientific Studies and Research Center. Syria's state news agency reported that Syrian air defense has shot down three Israeli missiles which targeted the site. 5 December 2017 Jabal Azzan, Aleppo: Syrian sources reported that an Iranian base was subjected to air strikes, causing huge explosions inside it. The sources said that they believe that the air strikes were conducted by the Israeli Air Force because of the absence of any flight by Russian or other aircraft at the time in the northern region. This was confirmed by the generalizations of the local observatories which monitor the movement of the air traffic in the north. 22 December 2017 Al-Qutayfah, Rif Dimashq: Israeli Air Force targeted the 155th Brigade's Scud missile base. Pro-government media denied the reports. 9 January 2018 Al-Qutayfah, Rif Dimashq: Israel attacked the 155th Brigade's Scud missile base. 7 February 2018 Jamraya, Rif Dimashq: the Syrian army claimed that early in the morning the Israeli Air Force fired missiles from Lebanese territory towards the military research facility of the Syrian Scientific Studies and Research Center. Tiyas, Homs: In response to the sighting of the drone crossing the Israeli border, 8 F-16s of the Israeli Air Force (IAF) struck Tiyas Military Airbase from which the Israeli military said the drone had launched, very likely with standoff weapons. Harduf, Jezreel Valley: The Israeli attack prompted a response from Syrian Air Defense systems, which after firing on the Israeli jets, shot down an Israeli F-16I fighter jet over northern Israel. Two weeks later, Israeli Defence Forces (IDF) stated that the F-16I was hit by a S-200 surface-to-air missile (SAM) with the crew failing to take proper evasive actions. The same statement reported that 13 SAMs had been fired at the 8 F-16Is which took part in the initial attack, with another 14 SAMs fired during the subsequent attack flights, resulting in a total of 27 missiles fired on the attacking jets. Mezzeh, Damascus: Mezzeh Military Airport. Serghaya, Rif Dimashq: A site of the Republican Guard. Madaya, Rif Dimashq: A site of the Republican Guard and other targets. Qalamoun Mountains: A 16th Brigade's site which is one of the most important military points containing air defense systems. Al-Dreij, Rif Dimashq: A site belonging to the 104th Brigade of the Republican Guard. Jbab, Daraa: The 79th Brigade and 89th Brigade. Khalkhalah, As-Suwayda: Regiment 159's Khalkhalah Military Airport. Qatana, Rif Dimashq: Wearhouses of the 10th Mechanised Division. As-Safira, Aleppo: Defense facilities for arms and ammunitions. Al-Nayrab, Aleppo: Aleppo International Airport. Jabal Azzan, Aleppo: An Iranian base. 7 March 2018 Jabal al-Mana, Rif Dimashq: Correspondent of Orient News reported that Israeli forces targeted long-range missiles launchers of Toshka rockets which belong to Hezbollah, adding that two platforms were destroyed and resulted in the killing of large numbers of Hezbollah militiants. The correspondent added that he heard the voices of ambulances who came to the place to transport the wounded to hospitals in Damascus. 25 March 2018 Beqaa Valley: Arabic media outlets reported that Israeli jets struck a number of Hezbollah positions along the Lebanon-Syria border. Lebanese al-Jadeed news reported the loud sounds heard by residents of the area were not explosions, but Israeli planes breaking the sound barrier, causing sonic booms. Hezbollah-affiliated Al Manar denied the reports and said that neither Hezbollah or the Syrian army were attacked by Israeli forces. 31 March 2018 Khalit Maryam, Nabatieh: An Israeli Hermes 450 drone crashed due to a technical failure. An additional Israeli drone bombed the crashed drone. The Lebanese Army issued a statement saying that the crashed drone was found to be equipped with four unexploded ordnance. A technical unit of the Lebanese Army detonated it. Jabab, Daraa: Correspondent of Orient News in the region reported Israeli airstrikes targeted a military site of the Iranian and regime militias belonging to the 89th Regiment of the 9th Armoured Division, reportedly after pro-Assad pages published pictures of military equipment which were destinated to reach Daraa. In addition, special sources had confirmed to Orient that the regime's militias had transferred chemicals to the site. Syrian official news agency SANA, citing its correspondent in Daraa, claimed that there is no truth to the reports by some media outlets about Israeli airstrikes on Syrian army sites in the north of the province. Jabal Azzan, Aleppo: Huge explosions were heard at an Iranian base. Some reports attributed that to an alleged Israeli aircraft attack. However, Hezbollah media sources denied the reports and said that the explosions at the site resulted from explosives detonating in a warehouse. Al-Arabiya reported that around 20 members of Hezbollah and Iranian-led militas were killed in the blast. The Syrian army reported that six missiles targeted Shayrat air base in Homs and three missiles targeted Dumayr airbase, and that the air defense systems intercepted nine of the missiles and accused the Israeli Air Force of attacking the air force. Later, they admitted that there had been no missile attack and that air defense systems had been activated as a result of a false alarm. They blamed Israel and the United States for electronic warfare that disrupted Syrian radar systems and caused a malfunction. Golan Heights: An errant mortar shell which was fired from Quneitra countryside have landed near the security fence in the northern area. al-Kawm, Quneitra: A Syrian military post was hit by precision artillery in retaliation of the IDF. Orient News's correspondent in the region reported that the Israel army shelled the artillery battalion of the Syrian army, which resulted in the destruction of artillery system within the battalion. Tell Salhab, Hama: An opposition source said one of the locations hit was the 'Brigade 47' army widely known as a recruitment center for Iranian-backed Shiite militias fighting alongside Assad forces. The Syrian opposition stated that 38 Syrian government soldiers were killed and 57 were injured. Unconfirmed reports stated that among the casualties was an Iranian general. Quneitra Governorate: Syrian opposition forces reported that they arrested a number of suspected Hezbollah members in the past week. The opposition forces posted a filmed confession of a suspect saying that he was awaiting orders to fire rockets at Israel. Arab media reported that eight members of the Syrian Air Force's 150th Air Defense Division were killed in a mysterious explosion in the morning on the Damascus-Suwayda road. Engineers and soldiers from the battalion, which is responsible for the operation of the anti-aircraft system S-200 and was responsible for the downing of the Israeli F-16 two months ago, took a transport vehicle and suddenly the explosion took place. According to Syrian sources, eight were killed and Israel was blamed for assassinating them. Al-Kiswah, Rif Dimashq: Israeli warplanes struck several military bases in Syria where there is significant Iranian presence. Two Israeli missiles that were targeting a weapons convoy at a base were downed near the al-Kiswah industrial zones close to Damascus. 9 Iranian or pro-Iranian militiamen were killed. Baath City, Quneitra: Israeli forces bombarded the area. Opposition-affiliated Al Jisr TV reported that Israel conducted a preemptive strike against a local Hezbollah cell which attempted to fire a Kornet anti-tank missile at an Israeli force patrolling in the Golan Heights. Golan Heights: Iranian elite forces on the Syrian-held side of the Golan Heights fired around 20 projectiles towards Israeli army positions. Syria: Israel responded with rounds of rocket fire into Syria, striking over 50 Iranian targets. Twenty-three fighters, among them 18 foreigners, were killed in the Israeli strikes. Amikam Norkin, Israeli Air Force commander, said Israel used its F-35 stealth fighters for the first time. Golan Heights: Local residents reported seeing an unidentified object being intercepted by the Iron Dome. The media initially reported that the reported object was a missile that was fired towards Israel, and later the media reported that it was actually a foreign drone. However, the Israeli army denied intercepting a missile or a drone, and claimed that the Iron Dome was triggered by a false alarm. Hama: massive explosions hit the Hama Military Airport. Sky News Arabia reported that it was caused by targeted strikes against an Iranian Bavar 373 long-range missile defense system that was put into service in March 2017. The Baghdad Post reported that Israeli jets targeted the IRGC positions at the airport and that the shelling came shortly after hitting positions of the Iraqi militias who gathered there. Dozen of Syrian and Iranians were reportedly killed in the blasts. A Syrian official denied the claims of an attack, saying that the explosions were a result of the warm temperatures. A Russian military expert quoted by Sputnik said that the explosions might have occurred due to failures in producing the bombs, denying that airstrikes has targeted the airbase, claiming that there is no information about moving Iranian air defense weapons to Syria, so the information on destroying it in the area is fake. 19 May 2018 Tulul al-Humur, Quneitra: Anadolu Agency reported that Hezbollah positions were shelled by Israeli tanks. Deir ez-Zor: Anadolu Agency reported that explosions were heard in the Deir ez-Zor Airport, and that local sources believe that the explosions were caused by Israeli airstrikes. A Syrian journalist Suhaib said in an interview by Radio Alkul that Israel targeted Iranian militia positions and Iranian arms shipment to its militias there, along the eastern countryside of the province and to the Deir al-Zour military airport. He added that the Israeli strikes focused on the Deir ez-Zor Airport, an important location for the militia of Hezbollah, and the headquarters in Abu Kamel east of Deir al-Zour, where the sectarian militias are concentrated, most notably the Iranian Revolutionary Guards and the Iraqi Popular Mobilization Forces supported by Iran. Syrian opposition released an image purporting to show the explosions that resulted by an one of the Israeli airstrikes on the Iranian militia's headquarters in the desert of Mayadin city. Abu Kamal, Deir ez-Zor: Syrian activists reported that the city was shaken by explosions as result of the Israeli Air Force airstrikes on a site of Iranian militias in the area. Syrian opposition released a video purporting to show the explosions and an Israeli aircraft. Naijah, Damascus: Sky News Arabia reported that massive explosions hit the Naijah area, near Damascus International Airport, targeting a Syrian military academy that serves as an Iranian/HIzballah intelligence war room and an Iranian electronic warfare. Abu Kamal - Hmeimeh, Deir ez-Zor: A military source quoted by Syrian official agency SANA said that the US-led coalition targeted some of the Syrian Arab Army's positions in that area, and that only material damage was caused. The Pentagon spokesman, Lieutenant Colonel Kone Faulkner, denied any US-led coalition responsibility in the attack. UK-Based SOHR chief Rami Abdel Rahman claimed that at least three vehicle were destroyed in the attack, and that 12 pro-government foreign fighters were killed. A military source from forces allied to Syria's government said the strikes had targeted two regime military positions near a frontline with IS, and claimed that there were no Iranian or Lebanese fighters among the dead. Al-Qusayr, Homs: Israeli warplanes struck the Al-Da'bah Military Airport, targeting a Hezbollah depot. 25 members of Hezbollah and Iranian forces who stationed in the airport were killed by the strikes. Jayrud - Flita, Rif Dimashq: Syrian opposition sources reported that Israeli wareplanes attacked a Hezbollah convoy while it was on its way to Lebanon, resulting in many dead and wounded. Al-Ghassaniyah, Homs: Syrian activists quoted by Sky News Arabia reported that Israeli wareplanes conducted air raids against Hezbollah positions, which resulted in violent explosions. Ali Ibrahim, a Syrian journalist, said in an interview by Sky News Arabia that more than 10 members of Hezbollah, including commanders, were killed in the airstrikes. Al-Bareda, Rif Dimashq: Arab sources, including Sky News Arabia, reported that Israeli warplanes conducted airstrikes against Syrian regime positions and its allied militias. Reportedly, the airstrikes destroyed weapons and ammunition depots belonging to Hezbollah. Manbij, Aleppo: A massive blast hit the Jirah Military Airbase. Pro-opposition sources claimed that it was caused by Israeli airstrikes. A Syrian military source claimed that a Syrian Arab Army (SAA) ammo depot caught on fire as a result of the warm temperatures. Tell Sultan, Idlib: A blast hit a Syrian military installation near the Abu al-Duhur Military Airbase. Pro-opposition sources reported that the blast occurred as a result of an Israeli airstrike on an Iranian ammunition depot. Other sources reported that the blast occurred as a result of overheating at a local ammo depot by the warm temperatures. Assal al-Ward, Rif Dimashq: Quoted local activists by Sky News Arabia said that violent explosions rocked the area after Israeli airstrikes attacked Hezbollah military positions and an arms depots. The Israeli government reported that the Shin Bet security agency foiled an attempt of a terrorist network to assassinate senior Israeli officials, including prime minister Benjamin Netanyahu. It was also revealed that this terrorist network was guided by Syrian handlers. Al-Qutayfah, Rif Dimashq: A series of explosions hit structures in the area. Local sources claimed that it was caused by an airstrike by the Israeli Air Force, reportedly after Hezbollah and Iranian-backed militias had transported trucks of weapons and missiles to the area. Pro-government sources, however, claimed that the explosions occurred inside a warehouse of weapons and ammunition and the reason for this was the sudden rise in temperatures. There were conflicting reports about what was damaged in the incident; some reported that it was a missile factory, while others reported it was missile stockpiles belonging to the Syrian Army and Hezbollah. Qalamoun Mountains: Syrian sources reported that Israel conducted airstrikes against Hezbollah positions near the Lebanon–Syria border. Tell Fatima, Quneitra: Activists from northern Daraa reported that Israel fired surface-to-surface missiles towards the town, targeting sophisticated air defense systems which were handed over to the Lebanese Hezbollah militia by the Assad regime. Orient News's correspondent reported that the target was an Iran-affiliated Pantsir-S1 missile system which was set up on Fatima Hills. Activists reported that the town, which is one of the points of concentration of Shiite militias loyal to Iran, as well as the towns of Deir al-Adas, Tal Kurom and Tal Bazak, have been shelled by the Israeli army for about two months. Al-Hari, Deir ez-Zor: A military source quoted by Syrian official agency SANA said that the US-led coalition targeted a Syrian military position, leaving a number of martyrs and wounding other people. However, the coalition's press office issued a statement, denying any responsibility for the attack. An US official told CNN that Israel, not the US, was responsible for the attack. UK-based SOHR reported that airstrike killed 52 foreign fighters allied with the Syrian government, mostly Iraqi Shiite militants. A local source cited by Reuters claimed that more than 95 Iranian-affiliated troops were killed. Hader, Quneitra: An Israeli Skylark drone crashed. The IDF announced that the crash was due to a technical problem. Quneitra Governorate: The IDF fired a Patriot missile at a drone that was incoming towards an Israeli territory. The drone retreated and no interception was recorded. Damascus: Syrian official news agency SANA reported that two Israeli missiles struck near Damascus International Airport. Local activists claimed that Israeli warplanes targeted an Iranian cargo plane that was being unloaded at the airport. UK-Based SOHR chief, Rami Abdel Rahman, told AFP that the Israeli missiles hit arms depots for Hezbollah near the airport and that the Syrian air defense systems failed to prevent the Israeli attack. Tiyas, Homs: Syrian sources reported that Israel targeted Iranian-led militias at the Tiyas Military Airbase. Mahajjah, Daraa: Explosions hit ammunition warehouses, of which the local residents claim are controlled by Iranian militias and Lebanese Hezbollah, and contain missiles and tank shells. Syrian opposition media reports claimed that the explosions were the result of an Israeli airstrike. Reportedly, the compound was completely destroyed and there were multiple casualties. Quneitra Governorate: Israeli forces struck a Syrian army post that was the source of a mortar shell which landed within the Syrian side of the border fence in the demilitarized zone, in violation of the Israel-Syria Separation of Forces Agreement-1974. The mortar shell is reportedly the result of a spillover due to fighting between the Syrian army and rebel groups in the area. Southern Syria: Arab sources reported that Israel air raids against an Iranian convoy resulted in the killing of Iranian-led and Hezbollah militants. Tiyas, Homs: Syrian State TV reported that Israeli aircraft targeted the T-4 air base near Homs, and Syrian air defense systems shot down a number of incoming missiles. While Syrian state media did not report any casualties, opposition-affiliated Al Jisr TV stated that 9 people were killed in the strikes. Citing Arab media sources, Al Jazeera claimed between four and six rockets hit the base and its surroundings. HaOn, Emek HaYarden: An Israeli Patriot missile intercepted a Syrian reconnaissance drone which infiltrated some 10 kilometers into northern Israel. Some parts of the UAV fell in the shore of the Sea of Galilee. It is estimated that this drone was an Iranian made Ababil model which was designed to fulfill reconnaissance, photography and assault missions. Quneitra Governorate Around midnight, Israel warplanes attacked multiple positions of the Syrian army. The Israeli army acknowledged it had struck three Syrian military posts in retaliation to the drone that infiltrated into Israeli airspace. These Syrian military posts were reportedly used as observatory and intelligence posts by Iranian forces. Orient News' correspondent in Quneitra area quoted a source claiming that casualties occurred in the ranks Iranian Shia militias, Hezbollah, and Assad militias and that the resulted death toll is at least 7 members. Bariqa, Quneitra: An Israeli Patriot missile intercepted a Syrian UAV over the Al-Rafid area in the buffer zone. Photos of the remains of the drone, released by Syrian opposition activists, revealed that the drone was a Russian Forpost, which is a licensed copy of the Israeli IAI Searcher. Al-Nayrab, Aleppo: Syrian official news agency SANA reported that Israel attacked a military site near Nayrab Military Airport. UK-based SOHR head, Rami Abdel Rahman, said that the Israeli missiles targeted an Iranian Revolutionary Guard center, and that the strke resulted in the death of 9 pro-government fighters, oh whom 6 were Syrians and 3 were foreigners. Syrian opposition sources quoted by Al-Jazeera said that the death toll was higher and reached 22, of whom 9 were Iranian Revolutionary Guards. Golan Heights: Rockets sirents were heard overnight, and shortly afterwards the IDF released a statement claiming that these were false alarms. Masyaf, Hama: Syrian state-run news agency SANA reported that Israel targeted a military site. UK-based SOHR said that the airstriiek targeted an Iranian-supervised facility which manufactures surface-to-surface missiles. Quneitra Governorate: Israeli forces fired David's Sling interceptor missiles towards two SS-21 surface-to-surface missiles that Israeli forces feared may fall in Israeli territory. However, when the Syrian missiles approached the border it became clear that they would not fall in Israeli territory, and therefore one of the interceptors was destroyed. Tasil, Daraa: Israel forces launched two Patriot missiles towards a Syrian Sukhoi Su-22 fighter jet, successfully intercepting it. Israel claimed it had penetrated what Israel considered its airpace on the Golan Heights by a margin of 2 kilometres. The Syrian government stated that the aircraft was flying on a mission against ISIL and other militants around Saida and was within Syrian airspace. The plane crashed on the Syrian side of the Heights. An Islamic State-affiliated news agency reported that the remains of the jet fell in Tasil. Sputnik reported that one pilot was killed in the incident and that the other one is lost. Two BM-21 Grad rockets landed in the Sea of Galilee. The rockets were initially thought to be a spillover of the fighting near the border, but were later believed to be an effort by the Islamic State group to draw Israel into a confrontation with the Syrian regime. The Israeli army announched that its airforce struck the rocket launcher of which was the source of the fire into Israeli territory, and that using its artillery it struck targets in the vicinity of the area from which the rockets were launched. Local activists quoted by SMART News Agency said that the Israeli bombardment targeted positions of the Syrian regime forces in the villages of Ghadir al-Bustan and Qalaitra in Quneitra area. A field source told Sputnik that Israel targeted military sites belonging to the Syrian army in the Quneitra countryside, and said that the Israel targeted one of the rocket launchers in addition to the Syrian army artillery. Sputnik's source also claimed that the Syrian air defenses fired three missiles from bases south of Damascus towards Israeli missiles in the Golan Heights. The Russian Defence Ministry thanked Israel for attacking the rocket launcher, adding that the attack resulted in the death of some Islamic State militants. 23 December 2018 The Israeli Defence Forces opened fire at a group of gunmen who crossed the 1974 ceasefire line and were approaching the border fence. The IDF worked to determine if the suspectss crossed the lines for intelligence-gathering purposes. 24 January 2019 : The IDF Spokesperson's Unit reported that Israeli forces operating near the border with Syria were fired upon, and that the Israeli forces returned fire. 12 April 2019 An independent satellite intelligence firm confirmed the destruction of an Iranian missile factory in Syria’s Masyaf District on April 12, believed to have been struck by IDF aircraft. The main industrial structures were completely destroyed, including the main hangar and the adjacent three production hangars and buildings. Israeli Intel Times also reported that the Israeli attack which occurred at 2:30am destroyed dozens of Iranian-made “Earthquake 2” missiles. Syrian state media also accused the IDF of carrying out the attack, but did not confirm the nature of the buildings hit. Israel – On 12 November 2012, Israeli prime minister Benjamin Netanyahu said "we are closely following the events and will respond accordingly," and that Israel "won't allow its borders to be breached or its citizens to be fired upon." On 6 January 2013, it was reported that Israel would be building an improved security fence in the ceasefire line between the Israeli-occupied and Syrian-controlled zones of the Golan Heights. Netanyahu stated that the Syrian army had largely "backed off" from the area, leaving it in control of "global jihad operatives" and that the fence would protect the "Jewish state" from "infiltrations and terror". An Israeli security official stated that around 10 kilometres (6.2 mi) of the fence had already been completed, with approximately 60 kilometres (37 mi) remaining. On 30 March 2018, Chief of General Staff of the Israel Defense Forces, Gadi Eizenkot, confirmed in an interview with Maariv that the Israeli Air Force continued to conduct operations in Syria since the February 2018 Israel–Syria incident. On 22 May 2018, during a conference in Herzliya, a senior Israeli Air Force officer said that Israel continued to strike targets in Syria since the May 2018 Israel–Iran incidents. German Magazine Contra questioned the occurrence of the attack alleging that "Israel has insisted that the S-300s wouldn't interfere with its ability to attack Syria, but in the space of over a month since then, not a single media report on such an attack has been made". Russia – On 18 September 2018, after the downing of the Russian IL-20M, Vladimir Putin attributed it (sic) to a "chain of tragic circumstances" and denied that the IDF was involved in the crash. Syria – On 13 November 2012, the Syrian government, through the United Nations Disengagement Observer Force (UNDOF), pledged to halt firing toward Israeli territory. Syrian opposition – Turkey's Anadolu news agency reported that the Free Syrian Army released a statement accusing Israel of attempting to "aid Assad's criminal regime" by firing into Syria. ^ a b "Assad And His Allies Threaten To Open A Front In Golan Heights". Middle East Media Research Institute. 21 May 2013. Retrieved 23 March 2018. ^ "IAF strikes ISIS-linked cell in Syria after cross-border fire on Golan". The Jerusalem Post. 27 November 2016. Retrieved 27 November 2016. ^ a b "WATCH: Thousands Turn Out for Funeral of Hezbollah Commander Killed on Israel-Syria Border". Haaretz. 19 January 2015. ^ a b c "2 soldiers lightly hurt after Syrian mortars hit Golan". Ynet. Retrieved 30 October 2014. ^ a b "Blast wounds three Israeli soldiers near Syria border". Syrian Observatory for Human Rights. 18 March 2014. ^ a b c "Explosive device detonated near IDF jeep on Syria border; 4 soldiers wounded". The Jerusalem Post. 18 March 2014. ^ a b "IDF soldier on Golan lightly injured from stray bullet fired from Syria". The Jerusalem Post. 8 September 2014. ^ "Two IAF pilots hurt after F-16 downed during retaliatory strike in Syria". Ynet. 10 February 2018. ^ "Breaking: Syrian air defense shoots down Israeli warplane". Al-Masdar News. 17 March 2017. Retrieved 26 June 2017. ^ Sputnik. "Syrian Air Defense Shoots Down Intruder Israeli Warplane, Hits Another One". Sputnik. Retrieved 26 June 2017. ^ a b "Philippines Pulls Troops From Zone Near Syria". The New York Times. 24 September 2014. Retrieved 22 June 2016. ^ a b "Drone shot down by IDF was Iranian". The Times of Israel. 2 September 2014. ^ a b "הערכה: הכטב"ם שחדר - תוצרת אירן". Mako. 12 July 2018. ^ a b "New photos reveal that Israel shot down Russian UAV in southern Syria (photos)". southfront.org. 15 July 2018. ^ a b "כלי טיס בלתי מאויש שהתקרב לגבול רמת הגולן יורט היום (שלישי) על ידי מערכת פטריוט, על פי הוראות הגנת שמי המדינה". Israel Defense Forces. 19 September 2017. ^ a b "טיל פטריוט יירט כלי טיס בלתי מאויש מסוריה". Ynet. 11 November 2017. ^ a b "Israeli missile downs Syrian drone over Golan Heights". The Times of Israel. 27 April 2017. ^ a b Lappin, Yaakov (22 March 2014). "14-year-old killed in Golan Heights in cross-border fire from Syria". The Jerusalem Post. ^ a b "Syrian mortar falls in northern Golan Heights, lightly injuring one". The Jerusalem Post. 27 August 2014. ^ Cite error: The named reference pressjuly was invoked but never defined (see the help page). ^ "Syrian mortars fired into Golan Heights". The Times of Israel. 25 September 2012. ^ "Mortar Shells Fired at Golan Heights; Damage, No Injuries". Arutz Sheva. 25 September 2012. ^ "Stray Bullet From Syria Hits IDF Jeep". Haaretz. 6 November 2012. ^ "Syrian Infighting Spills Into Israel 3 Mortar Shells Fired From Syria Hit Israel". Haaretz. 8 November 2012. ^ "קרא: באופוזיציה הסורית מתנצלים על ירי הפצמ"ר". Arutz Sheva. 8 November 2012. ^ "Syria crisis: Israeli tanks 'hit Syrian units' in Golan". BBC News. 12 November 2012. ^ "Rebels warn Israel against Syria interference". Ynet. 12 November 2012. ^ "Israel fires at two Syrian mortar batteries, reports 'direct hit'". Russia Today. 12 November 2012. ^ "Syrian soldiers may have been killed in Israeli strikes, says Israeli army". Al Jazeera. 18 November 2012. ^ "Fire exchanges on Syrian border; IDF jeep damaged". Ynet. 18 November 2012. Retrieved 30 October 2014. ^ "IDF jeep hit by stray bullets from Syria; no injuries". Ynet. 20 November 2012. Retrieved 24 June 2018. ^ "Gunfire from Syria hits Golan, no injuries, Israeli army says". NOW News. AFP. 26 November 2012. Retrieved 27 November 2012. ^ "Syria: Israel attacked military research center". Ynet. 31 January 2013. ^ "Officials to AP: Israel hit SA-17 missiles shipment". Ynet. 30 January 2013. ^ a b "Syria confirms Israel bombed site near Damascus". The Times of Israel. 30 January 2013. ^ "مصادر تبلغ (الزمان): القصف الاسرائيلي لمنشأة جمرايا السورية حدث قبل يومين من الاعلان عنه". Azzaman. 31 January 2013. ^ "Image indicates Syria building unscathed by Israel strike". Reuters. 6 February 2013. ^ a b "Rebels: Iranian official killed in airstrike on Syria". Ynet. 14 February 2013. ^ "Israel to 'immediately' respond to all Syrian cross-border shooting". Russia Today. 24 March 2013. ^ "Israel hits Syrian outpost in response to cross-border fire". The Times of Israel. 2 April 2013. ^ "ירי נשק קל וארטילריה לעבר כוח צה"ל ברמת הגולן". Megafon News. 13 April 2013. ^ "IDF troops come under fire along Syrian border". The Times of Israel. 12 April 2013. ^ "המורדים הסורים: ישראל שוב תקפה ליד דמשק". NRG. 28 April 2013. ^ ""צה"ל תקף מפקדת נשק כימי"". Kikar HaShabbat. 28 April 2013. ^ "Israel strikes Syria, says targeting Hezbollah arms". Reuters. 5 May 2013. ^ "Israel Targeted Iranian Missiles in Syria Attack". The New York Times. 4 May 2013. ^ "Israel says 'no winds of war' despite Syria air strikes". Reuters. 6 May 2013. ^ "ثر من 40 انفجاراً عقب غارات إسرائيلية على مواقع للأسد". Orient News. 5 May 2013. ^ "Timeline: Israeli attacks on Syrian targets". Al Jazeera. 5 May 2013. ^ "Israel carries out second air strike in Syria". The Guardian. 5 May 2013. ^ "Warning Syria". The Jerusalem Post. 16 May 2013. Retrieved 18 March 2018. ^ "Syria and Israel in exchange of fire". BBC News. 21 May 2013. Retrieved 30 October 2014. ^ "2 mortar shells explode in northern Golan Heights". Ynet. 5 June 2013. ^ "Huge blast rocks Damascus military airport". Russia Today. 16 June 2013. ^ "Explosions rock Damascus military airport". CNN. 17 June 2013. ^ "דיווחים בסוריה: ישראל שוב תקפה שדה תעופה". Ynet. 17 June 2013. ^ "Car Bomb Kills 10 Near Damascus". Voice of America. 17 June 2013. ^ "Syria naval base blast points to Israeli raid". Reuters. 9 July 2013. ^ "Syian rebels hint Israel behind attack on missile cache". The Jerusalem Post. 13 July 2013. ^ "Israel Airstrike Targeted Advanced Missiles That Russia Sold to Syria, U.S. Says". The New York Times. 13 July 2013. ^ "Israelis strike at Syrian missiles". Sunday Times. 14 July 2013. ^ "REPORT: Israeli submarine strike hit Syrian arms depot". The Jerusalem Post. 14 July 2013. ^ "RT source: Israeli strike on Syria was carried out from Turkish base". Russia Today. 15 July 2013. ^ "Syrian rebels hint Israel behind attack on missile cache". The Jerusalem Post. 9 July 2013. ^ "Syrian mortar shells hit Israeli-occupied ceasefire zone". Al Arabiya. 17 July 2013. ^ "IDF patrol comes under fire on Golan Heights". The Jerusalem Post. 17 July 2013. ^ "דיווחים בסוריה: ישראל תקפה שיירת נשק". Ynet. 27 July 2013. ^ "IDF strikes Syrian army post following mortar shells falling on Golan". The Jerusalem Post. 17 August 2013. ^ "'Israel strikes Hezbollah-bound missile shipment'". The Times of Israel. 23 October 2013. ^ "Huge explosion reported at Syrian air defense base". The Times of Israel. 31 October 2013. ^ "Israel strikes Russian weapons shipment in Syria". The Guardian. 1 November 2013. ^ "Officials: Israel strikes Russian weapons shipment in Syria". Syrian Observatory for Human Rights. 1 November 2013. ^ "Israeli jets 'launch Syria strike to destroy missiles'". The Daily Telegraph. 31 October 2013. ^ "القلمون : طائرة إسرائيلية بدون طيار تقصف قافلة ذخائر للثوار". JBC News. 16 November 2013. ^ "Syrians targeted Israeli patrol on Golan with bomb: Israel". Syrian Observatory for Human Rights. 7 December 2013. ^ "Syrian opposition: Israeli jets bomb missile launchers in Latakia". The Jerusalem Post. 27 January 2014. ^ "Four Hezbollah men said killed in reported Israeli strike". The Times of Israel. 26 February 2014. ^ "الطائرات الإسرائيلية قصفت مرابض مدفعية لحزب الله تستهدف القلمون". Al Bawaba. 26 February 2014. ^ "Hezbollah main suspect in Golan Heights rocket attack". The Daily Star. 3 March 2014. ^ "Israel shoots at Hezbollah fighters on Syrian Golan". Syrian Observatory for Human Rights. 6 March 2014. ^ "Israel strikes Syrian army targets in response to attack on IDF jeep". The Jerusalem Post. 19 March 2014. ^ "1 Syrian soldier killed, 7 wounded in Israeli airstrikes". Chennai, India: The Hindu. 19 March 2014. ^ "IDF soldiers shoot two gunmen attempting to sabotage border fence on Golan". The Jerusalem Post. 28 March 2014. ^ "IDF strikes targets in Gaza; fires into Syria following shelling from northern border". The Jerusalem Post. 2 June 2014. ^ "Two Syrian mortar shells land in Golan Heights". Ynet. 4 June 2014. ^ "Israel strikes kill ten members of Syrian army: monitoring group". Reuters. 23 June 2014. Retrieved 30 October 2014. ^ "Israel warplanes attacks Syrian sites". Syrian Observatory for Human Rights. 23 June 2014. ^ "Israel fires into Syria after mortar shell hits Golan". The Times of Israel. 7 July 2014. ^ "Rockets fired from Lebanon at Nahariya; Iron Dome shoots down entire barrage over Ashkelon". The Jerusalem Post. 14 July 2014. ^ "اربعة قتلى في قصف جوي اسرائيلي على الجولان السوري". Annahar. 15 July 2014. ^ "Quneitra, Syria - Report: Israeli Airstrikes In Syria Kill 18". Vos Iz Neias?. 15 July 2014. ^ "Rockets from Syria land in Golan Heights after Lebanese Katyusha attack". The Jerusalem Post. 24 August 2014. ^ "IDF shoots down drone that entered Israeli air space from Syria". The Jerusalem Post. 31 August 2014. ^ "גבול סוריה: יריות לעבר עיתונאים". Israel Hayom. 2 September 2014. ^ "IDF attacks Syrian army position after stray projectile hits Golan". Ynet. 4 September 2014. ^ "Israel jets strike near Damascus: Syria agency". Syrian Observatory for Human Rights. 7 December 2014. ^ "Israeli strikes killed Hizbullah troops at airport arms depot near Damascus". Syrian Observatory for Human Rights. 10 December 2014. ^ "Syria Daily, Dec 7: Islamic State v. Regime Forces for Deir Ez Zor Airport". EA WorldView. 7 December 2014. ^ "Reports: Syria may have shot down drone during Israel attack on military targets near Damascus". WTF RLY REPORT. 7 December 2014. ^ "Israeli jets 'strike near Damascus' - Syrian army". BBC News. 7 December 2014. ^ "Arab Reports: Israeli Jets Strike Dimas Air Base In Damascus, Syria". JPUpdates. 7 December 2014. ^ "SOHR on Facebook". Syrian Observatory for Human Rights. 9 December 2014. ^ "The Israeli airstrike kill 3 members of the regime forces, while the regime helicopters drop a lot of explosive barrels on several areas in the countryside of Daraa". Syrian Observatory for Human Rights. 18 January 2015. ^ "Hezbollah Says 6 Fighters Killed in Israeli Attack on Syria". Syrian Observatory for Human Rights. 20 January 2015. ^ "Report: Six Iranians killed in Israeli strike in Syria, including Revolutionary Guards general". The Jerusalem Post. 19 January 2015. ^ "Two projectiles fired from Syria land in Golan Heights, IDF returns fire". The Jerusalem Post. 2015-01-27. ^ "Bombardment by Israel forces on areas in Jolan". Syrian Observatory for Human Rights. 27 January 2015. ^ "مصدر أمني لـ"عربي21": إسرائيل قصفت الفرقة 18 بريف حمص". Arabi21. 2 February 2015. ^ a b "קצין נפצע קל מאש שנפתחה מכיוון סוריה". Arutz Sheva. 10 March 2015. ^ "פצצת מרגמה נפלה ברמת הגולן". Arutz Sheva. 15 April 2015. ^ "Israel Denies Report It Struck Near Syria-Lebanon Border". Haaretz. 27 April 2015. ^ "'IAF struck missile base in Syria,' Al-Jazeera report says". Al Jazeera. Retrieved 22 June 2016. ^ a b "Israel strike 'kills militants' on Golan Heights frontier". BBC News. Retrieved 22 June 2016. ^ "New Israeli airstrike reported in Syrian territory". The Times of Israel. 27 April 2015. ^ "Israeli jets strike suspected Hezbollah targets in Syria". Syrian Observatory for Human Rights. 27 April 2015. ^ "Sources: Israel not behind second attack on Syria-Lebanon border". Ynet. 27 April 2015. ^ "פצצות מרגמה בגולן". Arutz Sheva. 28 April 2015. ^ "הלחימה בסוריה נמשכת: אזעקה בגולן". Arutz Sheva. 17 June 2015. ^ "اسرائيل تقصف الفوج 150 خوفاً من سيطرة المعارضة على اسلحة نوعية". Souriat.com. 18 June 2015. ^ "آخرها الفوج 150: كيف تساعد إسرائيل النظام باستهداف مواقعه؟!". Orient News. 19 June 2015. ^ a b "Syrian State Media Praises Druze 'Lynch' Mob Attack on Israeli Ambulance". Vice News. Retrieved 22 June 2016. ^ a b c d "Israel vows crackdown after Druze 'lynching' of Syrian". The Daily Star. Retrieved 22 June 2016. ^ "Rocket alert sirens sound twice in 30 minutes in northern Golan Heights". The Jerusalem Post. 2015-06-28. ^ "الجيش الإسرائيلي يقتحم مخيماً للنازحين السوريين قرب الجولان المحتل". Al-Araby Al-Jadeed. 8 July 2015. ^ "الجيش الإسرائيلي يقتحم مخيماً للنازحين السوريين". Syria Mubasher. 8 July 2015. ^ "Israeli army incursion into Syria hits refugee camp". The Electronic Intifada. 20 July 2015. ^ "Report: Israeli Air Force strikes target in Syria, killing at least 2 people". The Jerusalem Post. 29 July 2015. ^ "Israeli warplanes kill 5 members of Hezbollah and what so-called Resistance of Liberating al- Golan". Syrian Observatory for Human Rights. 29 July 2015. ^ "שני פצמ"רים התפוצצו בצפון הגולן". Arutz Sheva. 3 August 2015. ^ "IDF strikes targets in Syria as rockets launched into northern Israel Thursday". The Jerusalem Post. ^ "الجيش الإسرائيلي يدفع بتعزيزات على الحدود مع سوريا". Al Khaleej Online. 21 August 2015. ^ a b "إسرائيل تقصف مواقع عسكرية للنظام والأخير يرد بقصف المدنيين في مناطق المعارضة". alsouria.net. 21 August 2015. ^ Fadel, Leith (20 August 2015). "Israeli Air Force Strikes the Syrian Army in the Golan Heights". Al-Masdar News. Retrieved 22 June 2016. ^ "بعد القذائف الأربع.. ما هي المواقع التي قصفتها إسرائيل في سوريا؟". Enab Baladi. 21 August 2015. ^ "Syrian Army Shoots Down Israeli Fighter Jet over Quneitra". Fars News Agency. 22 August 2015. ^ "Israel airstrikes leave more casualties in Reef Dimashq and Quneitra". Syrian Observatory for Human Rights. 21 August 2015. ^ "IAF strikes in Syria, kills rocket launchers". Ynet. Retrieved 22 June 2016. ^ "IDF offier: largest Israeli retaliation yet". Ynet. Retrieved 22 June 2016. ^ a b c d "Israel strikes Syria after stray rockets land in Golan". Al Jazeera. 27 September 2015. ^ a b "Israel strikes Syrian targets in Golan Heights after rocket attacks". CNN. 21 August 2015. ^ "5 people killed in the Israeli airstrikes on the countryside of al- Quneitera". Syrian Observatory for Human Rights. 21 August 2015. ^ "5 members of NDF killed in the Israeli airstrikes on the countryside of al- Quneitera". Syrian Observatory for Human Rights. 21 August 2015. ^ a b "Israel hits Syrian army on Golan after 'errant' cross-border fire". Reuters. 27 September 2015. ^ a b "Israel not coordinating with Russia in Syria, defense minister says". The Times of Israel. 29 September 2015. ^ "Several Israeli rockets target a military company for the regime forces in the countryside of Al-Quneitra". Syrian Observatory for Human Rights. 27 September 2015. ^ "Reports: IAF targets Hezbollah assets in Syria". The Times of Israel. 31 October 2015. ^ "Report: Israel Air Force Strikes Hezbollah, Regime Facilities in Syria". Haaretz. 31 October 2015. ^ "غارات إٍسرائيلية جديدة بسوريا تختبر نجاح التنسيق مع روسيا". Arabi21. 2 November 2015. ^ "Israeli warplanes strike Hezbollah convoy in Syria: Arab media reports". i24NEWS. 31 October 2015. ^ "דיווח: חיל האוויר תקף יעדים של הצבא הסורי". NRG. 1 November 2015. ^ "Syria says Israeli airstrikes hit near Damascus airport". The Times of Israel. 11 November 2015. ^ "Syrian opposition: IAF struck Hezbollah, regime targets near Syria–Lebanon border". The Jerusalem Post. ^ "اخر اخبار سوريا الان غارات إسرائيلية في القلمون ورسالة النداء الأخير لتنظيم "داعش"". bwabtk.com. 27 November 2015. ^ "Report: Israel Air Force strikes targets in Syria near Lebanese border". The Jerusalem Post. ^ "Israeli jets carry out strikes north of Damascus — reports". The Times of Israel. 4 December 2015. ^ "Israeli Air Force kills notorious Hezbollah commander in Syria". Long War Journal. 22 December 2015. ^ "Syrian media claims Israeli strikes hit Hezbollah bases". The Jerusalem Post. 27 December 2015. ^ "Report: Israeli air force strikes Hezbollah in Qalamoun, Syria". Arutz Sheva. 11 January 2016. ^ "Syrian media claims Israeli jets struck army base, Hezbollah base". The Jerusalem Post. 9 February 2016. ^ "Pro-Syrian military source denies reports of Israeli strikes inside Syria". Reuters. 17 February 2016. ^ "Breaking: Israel kills Hezbollah commander in airstrike over Damascus". Al Masdar News. 13 May 2016. ^ "Israeli raids on Syrian army sites in Homs". Middle East Monitor. 9 June 2016. ^ "IAF bombs Syrian military base near Damascus: Arab sources". Debkafile. 8 June 2016. ^ "Israeli military says attacked two Syrian army targets". Reuters. 4 July 2016. ^ "Israel strikes Syrian Army in Golan Heights, despite non-intervention policy". Syrian Observatory for Human Rights. 4 July 2016. ^ a b "من جديد .. العدو الصهيوني يقصف بناء في مدينة القنيطرة جنوب سوريا". Tasnim News Agency. 6 July 2016. ^ "Israeli warplanes strike government city in the Golan Heights". Al-Masdar News. 5 July 2016. ^ a b c "غارة إسرائيلية تضرب مركزاً أمنياً لقوات الأسد في القنيطرة". souriat.com. 20 July 2016. ^ "Israeli warplane targets the area of governorate building in Baath city in Quneitra". Syrian Observatory for Human Rights. 20 July 2016. ^ "דיווחים: "חיל האוויר תקף עמדת צבא אסד בסוריה"". Ynet. 20 July 2016. ^ "Syria post near Golan border bombed, unclear if Israel involved". The Times of Israel. 20 July 2016. ^ "Israel Attacks in Syria After Errant Fire From Quneitra Hits Israeli Golan". Haaretz. 25 July 2016. ^ "Israeli Drone Strikes Target the National Defense Forces and the PFLP-GC". Al-Masdar News. 29 July 2016. ^ "צה"ל תקף בסוריה בתגובה לנפילת פצמ"ר בגולן". NRG. 22 August 2016. ^ "Mortar shell fired from Syria hits Israeli side of Golan". The Times of Israel. 4 September 2016. ^ "Israel pounds Syrian govt positions in Golan Heights with retaliatory fire". Russia Today. 5 September 2016. ^ "Opposition media reports barrage in village in demilitarized zone; Syrian state news says planes caused 'material damage'". The Times of Israel. 4 September 2014. ^ a b "בעקבות הנפילה בגולן: חיל האוויר תקף מטרות בסוריה". NRG. 8 September 2016. ^ "Israel warplanes target Syrian brigade in Quneitra". Syrian Observatory for Human Rights. 8 September 2016. ^ "בפעם השלישית השבוע: פצמ"ר נפלה ברמת הגולן; צה"ל תקף בסוריה". Walla!. 10 September 2016. ^ "בפעם השלישית החודש: פצמ"ר נפל ברמת הגולן". NRG. 12 September 2016. ^ a b c d Davide Mastracci. 'Syria says it shot down Israeli planes — Israel says it's `total lies`'. Vice News. 13 September 2016. ^ "Israeli Warplanes target regime bastions near Quneitra". Syrian Observatory for Human Rights. 13 September 2016. ^ "More casualties in the ranks of the regime forces by the Israeli airstrike". Syrian Observatory for Human Rights. 21 September 2016. ^ "כיפת ברזל הופעלה פעמיים בעקבות ירי לעבר רמת הגולן". Ynet. 17 September 2016. ^ "Syrian soldier said killed by Israeli retaliatory fire on Golan". The Times of Israel. 18 September 2016. ^ "פצמ"ר מסוריה נפל ברמת הגולן; צה"ל תקף סוללת תותחים של אסד". Walla!. 9 November 2016. ^ "Isis and Israel clash for first time after jihadis open fire on IDF". The Independent. 2016-11-27. ^ ""אש בכל הכוח": המג"ד משחזר את הקרב הראשון מול דאעש בגולן". Walla!. 30 December 2016. ^ "Israel bombs suspected Islamic State militant hideout in Syria". Fox News. 28 November 2016. ^ "Israeli Airstrikes Target ISIS Facility in Syria, Hours After First Direct Clashes in Golan Heights". Haaretz. November 28, 2016. ^ "אזעקה בדרום הגולן, לא זוהו נפילות". Arutz Sheva. 29 November 2016. ^ "Rockets fired from Sinai at Eilat, errant Syrian mortar lands in north". Ynet. 9 February 2017. ^ "غارة إسرائيلية على موقع للجيش السوري بالقنيطرة وسقوط صواريخ في إيلات". Al Mayadeen. 8 February 2017. ^ Euan McKirdy, Oren Liebermann. "Israeli jets strike inside Syria; evade anti-aircraft missiles". CNN. Retrieved 2017-03-17. ^ "סוריה: "4 מטוסים תקפו מוצב צבאי. תהיה תגובה ישירה"". Ynet (in Hebrew). 2017-03-17. Retrieved 2017-03-17. ^ News, Defense. "Israel explains Arrow intercept of Syrian SAM". Defense News. Retrieved 26 June 2017. ^ a b "Israel said to strike Syria for second time in 24 hours, amid threats from Damascus". The Times of Israel. 20 March 2017. ^ ""Israeli" warplanes target the road to the capital Damascus; kill a person inside a car". Syrian Observatory for Human Rights. 19 March 2017. ^ "Hezbollah affiliate killed in suspected Israeli drone strike in Syria". Syrian Observatory for Human Rights. 20 March 2017. ^ "Israeli drone shot down by Syria forces". The Times of Israel. 21 March 2017. ^ "Israeli 'Skylark' drone slams into Lebanese territory". The Jerusalem Post. 22 May 2017. ^ "נערה נפצעה קל מקליע שנורה מסוריה". Arutz Sheva. 7 April 2017. ^ "Three mortar shells from Syria land in northern Golan Heights". The Times of Israel. 21 April 2017. ^ "שלושה פצמ"רים נפלו ברמת הגולן; צה"ל השיב בירי לעמדות סוריות". Walla!. 22 April 2017. ^ "Israeli airstrikes target Quneitra countryside". Syrian Observatory for Human Rights. 22 April 2017. ^ "Deadly Israeli strikes target Syria's Quneitra province". Al Jazeera. 23 April 2017. Retrieved 2017-09-13. ^ "النظام يعلن عن غارة إسرائيلية بالقنيطرة وتل أبيب تنفي". Al Jazeera. 23 April 2017. ^ "New Israeli shelling kills 3 members of National Defense Forces (NDF) loyal to the Syrian Regime in the countryside of Al-Quneitra". Syrian Observatory for Human Rights. 23 April 2017. ^ "Israel strikes arms depot near Damascus airport: sources". Reuters. 27 April 2017. ^ "Arab media reports Israeli strike on Syrian army near border". The Times of Israel. 29 April 2017. ^ "BREAKING: Syrian Army shoots down armed Israeli drone which killed 3 soldiers". Al-Masdar News. 27 May 2017. ^ "Hezbollah-affiliated radio denies Israeli attack in Syria". The Times of Israel. 27 May 2017. ^ Carey, Andrew. "Israel strikes Syrian military near Golan Heights". CNN. Retrieved 26 June 2017. ^ Yusha Yuseef from Al-Masdar: "13 Syrian soldiers were martyred by the Israeli air strikes." ^ "Syrian shells land in Golan Heights, sparking IDF strikes". The Times of Israel. 24 June 2017. ^ "דובר צה"ל: לא היה ירי לגולן". Arutz Sheva. 26 June 2017. ^ "Israel launches more airstrikes against Syrian Army troops in Golan Heights, 2 soldiers killed". Al-Masdar News. 26 June 2017. ^ "Syria says Israeli missile strike near Damascus airport confirmed". The Jerusalem Post. 27 June 2017. ^ "Israel attacks Syrian position after mortar lands in Golan Heights". Reuters. 28 June 2017. ^ "Israeli warplanes renew their targeting for the regime forces in the countryside of Quneitra". Syrian Observatory for Human Rights. 28 June 2017. ^ "צה"ל תקף בסוריה בתגובה לזליגת הירי". Israel Hayom. 30 June 2017. ^ "Israeli airstrikes target again positions of the regime forces and their allied militiamen in the countryside of al-Quneitra". Syrian Observatory for Human Rights. 1 July 2017. ^ "Israeli missile strikes target the regime forces in the northern sector of Al-Quneitra countryside". Syrian Observatory for Human Rights. 4 July 2017. ^ "Israeli missile strikes target missile depots, a research center and a camp west of Hama killing and injuring 7 members of the regime forces at least". Syrian Observatory for Human Rights. 7 September 2017. ^ "Iran deployed troops in most army bases: military source". Zaman al-Wasel. 10 February 2018. ^ "Israeli jets reportedly strike weapons depot outside Damascus". The Times of Israel. 22 September 2017. ^ "Israeli strikes near Damascus International Airplane targeted arsenals of the Lebanese Hezbollah". Syrian Observatory for Human Rights. 22 September 2017. ^ "Israeli warplanes bombed Hezbollah units in Syria's Quneitra province – reports". southfront.org. 26 September 2017. ^ "مصادر للميادين نت: طائرة سورية تفادت صاروخاً في الشوكتلية بريف القنيطرة". Al Mayadeen. 26 September 2017. ^ "אזרח זר נפצע מירי בדרום הגולן". Arutz Sheva. 11 October 2017. ^ "Israel's Latest Strike in Syria: What We Know So Far". Haaretz. 16 October 2017. ^ "Israeli aerial strikes target a position of the regime forces in the countryside of the capital Damascus". Syrian Observatory for Human Rights. 16 October 2017. ^ "רקטה מסוריה נחתה ברמת הגולן; צה"ל תקף בתגובה עמדה של צבא אסד". Walla!. 19 October 2017. ^ "Israeli targeting on a position of the regime forces in the countryside of Khan Arnabah town near the occupied Syrian Golan". Syrian Observatory for Human Rights. 19 October 2017. ^ Ahronheim, Anna (21 October 2017). "Israel launches retaliatory strikes on Syrian artillery positions". The Jerusalem Post. ^ "In an almost daily incident, the Israeli shells target positions controlled by the regime forces on the border with the occupied Syrian Golan". Syrian Observatory for Human Rights. 21 October 2017. ^ "Jaysh Khalid Ibn Al-Walid loses 10 of its commanders and members in Israeli strikes targeted a town in Yarmouk Basin west of Daraa". Syrian Observatory for Human Rights. 23 October 2017. ^ "Syria war: Israeli jets 'strike factory near Homs'". BBC News. 2 November 2017. ^ ""Israeli strikes" target a military facility in the industrial area of Hisyah in central Syria cause fires in the area". Syrian Observatory for Human Rights. 1 November 2017. ^ "Israeli warplanes have struck inside Syria". Syrian Observatory for Human Rights. 2 November 2017. ^ "Al-Qaeda gains ground in the Golan Heights, assaults major Syrian Army stronghold". Al-Masdar News. 3 November 2017. ^ "Video From Recent Syria Attack Shows Israel Assisting, Opening Border Gate For Terrorists". Activist Post. 3 November 2017. ^ "Are al-Qaeda Affiliates Fighting Alongside U.S. Rebels in Syria's South?". The American Conservative. 25 June 2018. ^ "הלחימה בגולן הסורי: תושב מג'דל שמס נפצע קל מזליגת ירי". Ynet. 3 November 2017. ^ "In rare step, Israel says it will help Syrian Druze village fend off jihadists". The Times of Israel. 3 November 2017. ^ "IDF vows to protect Syrian Druze village after Syrian spillover". The Jerusalem Post. 3 November 2017. ^ "Israeli Army Shelling Rebel Positions In Trinjeh After Rebels Started Assault Towards Druze Village Hadar". Syrian Civil War Map. 3 November 2018. ^ "FSA Breaks Siege of Beit Jinn but Later Retreats as Israeli Forces Intervene on Assad Militias' Side". National Coalition for Syrian Revolutionary and Opposition Forces. 4 November 2018. ^ "Israel's deeping involvement with Syria's rebels". War on the Rocks. 14 February 2018. ^ "Explosion over Al-Golan area in the Syrian South caused by a new Israeli targeting". Syrian Observatory for Human Rights. 11 November 2017. ^ "الجيش الإسرائيلي يقصف طريقا خاضعا لسيطرة "الحر" جنوب القنيطرة". SMART News Agency. 13 November 2017. ^ a b "الجيش الإسرائيلي يطلق النار باتجاه موقع لقوات النظام السوري". Arab48. 18 November 2017. ^ "A shell believed to be "Israeli" hits Al-Quneitra countryside and explosion in Idlib countryside kills and injures members of Hayyaat Tahrir al-Sham". Syrian Observatory for Human Rights. 18 November 2017. ^ "Shelling targets towns and villages in the countryside of Homs leaves injuries and an "Israeli" shell targets the countryside of Quneitra". Syrian Observatory for Human Rights. 19 November 2017. ^ "Exclusive: Israel, Free Syrian Army to launch joint offensive in southern Syria". Al-Masdar News. 10 December 2017. ^ "Airstrike on Iranian base in Syria raises questions". The Jerusalem Post. 2 December 2017. ^ "Syria Claims Israeli Strike on Military Base Near Damascus". Haaretz. 2 December 2017. ^ "Army's Air Defense intercepts Israeli missile aggression on a military site in Damascus countryside". Syrian Arab News Agency. 2 December 2017. ^ "Arab media: 12 Iranians killed in 'Israeli strike' in Syria". The Times of Israel. 2 December 2017. ^ "Israeli jets reported to strike Syrian military site near Damascus". The Times of Israel. 5 December 2017. ^ "Syria Says it Shot Down 3 Israeli Missiles Near Damascus". Syrian Observatory for Human Rights. 5 December 2017. ^ "Army's Air Defense shoots down 3 Israeli missiles near Damascus countryside". Syrian Arab News Agency. 5 December 2017. ^ "هل قصفت إسرائيل قاعدة جبل عزان الإيرانية في حلب؟". Almodon. 6 December 2017. ^ "Israeli airstrike targets Scud missile base near Damascus: activists". Zaman Al Wasl. 23 December 2017. ^ "Syria Confirms Israel Strikes Near Damascus With Jets, 'Ground-to-ground Missiles Intercepted'". Haaretz. 9 January 2018. ^ "Report: Israel Strikes Military Facility Near Damascus". The Media Line. 9 January 2018. ^ "Reports: Israel bombed Islamic State positions in southern Syria". The Times of Israel. 1 February 2018. ^ "סוריה: ישראל תקפה ליד דמשק, מערכות ההגנה הגיבו". Ynet. 7 February 2018. ^ "Syrian downing of F-16I begs question: Why didn't Israel deploy F-35s?". Defense News. 13 February 2018. ^ "Netanyahu says Israel undeterred after Syria shoots down F-16". Reuters. 11 February 2018. ^ "Investigation finds pilots of downed F-16 failed to defend themselves". Ynet. Retrieved 2018-04-30. ^ Israel says its airstrikes took out half of Syria's air defenses, Los Angeles Times, Feb 11, 2018. Accessed Feb 12, 2018. ^ "هذه المواقع التي استهدفتها "إسرائيل" في سوريا خلال 24 ساعة !!". Radio Amal FM. 11 February 2018. ^ "ملخّص أحداث "السبت" 10-2-2018: نظام الأسد يسقط طائرة إسرائيلية لأول مرة منذ أربعين عاماً، وإسرائيل تشنّ مئات الغارات أهمها:". Al-Buraq Media. 10 February 2018. ^ "غارات لطيران مجهول تضرب جبل عزان جنوب حلب". Qasioun News Agency. 11 February 2018. ^ "The Latest: Netanyahu: Strikes severe blows to Syria, Iran". Daily Mail. 11 February 2018. Retrieved 11 February 2018. ^ "What led to the intense confrontation between Syria and Israel this past weekend?". Al Masdar News. 12 February 2018. ^ "قتلى لـ "حزب الله" في قصف إسرائيلي على ريف دمشق". Orient News. 7 March 2018. ^ "طائرات إسرائيلية تستهدف موقعاً للميليشيات الإيرانية في درعا". Orient News. 31 March 2018. ^ "SANA correspondent in Daraa: No truth to reports about Israeli attack on Syrian Arab Army sites". Syrian Arab News Agency. 31 March 2018. ^ "Israeli attack on T-4 Airbase killed 7 Iranian soldiers". Al-Masdar News. 10 April 2018. ^ "Syrian media: explosions at largest Iranian base in Syria". The Jerusalem Post. 14 April 2018. ^ "Blast rocks Syria region hosting Iran-backed fighters". Syrian Observatory for Human Rights. 15 April 2018. ^ "Blast rocks government-controlled Aleppo known for hosting Iran-backed fighters". Syrian Observatory for Human Rights. 15 April 2018. ^ a b "דיווח: פיצוץ עז בבסיס איראני בסוריה". Israel Hayom. 15 April 2018. ^ "סוריה: לא הייתה תקיפה חדשה, ישראל וארה"ב פגעו במערכת הרדאר שלנו". Ynet. 17 April 2018. ^ "Israel retaliates after errant mortar shell falls in Golan Heights". The Jerusalem Post. 23 April 2018. ^ "إسرائيل تدمر مدفعية لنظام الأسد في ريف القنيطرة". Orient News. 28 May 2018. ^ "Watch: Syrian army says 'enemy' rocket attacks strike at military bases". The Jerusalem Post. 30 April 2018. ^ "Iranians killed in alleged Israeli strike on military site in Syria". The Jerusalem Post. 30 April 2018. ^ "Iran denies it was targeted in Syria strikes, claims no troops killed". The Times of Israel. 30 April 2018. ^ "Nabbed Hezbollah member says he was awaiting orders to fire rockets at Israel". The Times of Israel. 7 May 2018. ^ "סוריה: פיצוץ מסתורי שכוון נגד אנשי מערך ההגנה האווירית". Ynet. 7 May 2018. ^ "Syria accuses Israel of new strikes while IDF orders bomb shelters opened". The Jerusalem Post. 8 May 2018. ^ "Fire caused by downing of the two Israeli missiles in al-Kisweh area". Syrian Arab News Agency. 9 May 2018. ^ a b "Alleged Israeli strike reported at Iran-linked military site near Damascus". The Times of Israel. 8 May 2018. ^ "آخر التطورات التي شهدتها المنطقة الحدودية مع الجولان المحتل". Al Jisr TV on YoutTube. 10 May 2018. ^ "Projectiles fired towards Israeli forward defensive line in the golan". The Jerusalem Post. 10 May 2018. ^ "Israel targets Iranian forces in Syria after rocket attack on Golan Heights". Fox News. 10 May 2018. ^ "Israel launched a barrage of airstrikes on 50 Iranian targets in Syria — a massive escalation that could lead to all-out war". Fox News. 10 May 2018. ^ "Israel Launches Most Extensive Strike in Syria in Decades After Iranian Rocket Barrage". Haaretz. 11 May 2018. ^ Kubovich, Yaniv (22 May 2018). "Israel Is First Country in World to Carry Out 'Operational Attack' With the F-35 Stealth Fighter, Air Force Chief Says". Business Insider. ^ "Eleven Iranians among dead in Israel strikes on Syria Thursday". Syrian Observatory for Human Rights. 15 May 2018. ^ "Rocket sirens blare in Golan, Iron Dome set off in false alarm". The Times of Israel. 17 May 2018. ^ "11 said killed, dozens hurt in blasts at Syria's Hama air base, cause unclear". The Times of Israel. 18 May 2018. ^ "Video: Israel hits IRGC gatherings near Hama airport". The Baghdad Post. 18 May 2018. ^ "Exclusive: A ground force caused big explosion at Hama air base with 8 missiles". Debkafile. 18 May 2018. ^ "Mysterious blast rocks army airbase in Hama". Al-Masdar News. 18 May 2018. ^ "Russian Expert Reveals New Theory For Hama Airbase Explosions". Qasioun News Agency. 19 May 2018. ^ "Death toll from blasts at Syria airbase climbs to 28; rebels take responsibility". The Times of Israel. 20 May 2018. ^ "דיווח: סוריה מרחיקה את איראן". Israel Hayom. 28 May 2018. ^ a b "Israel shells Hezbollah positions in southern Syria". Anadolu Agency. 19 May 2018. ^ "مصدر صحفي: الضربات الجوية على دير الزور سببها دخول شحنة أسلحة إيرانية". Radio Alkul. 19 May 2018. ^ "أنباء عن غارات إسرائيلية على مواقع إيرانية في دير الزور". Al Fayha. 19 May 2018. ^ "Iranian electronic warfare facility blown up south of Damascus, second explosion in 4 days". Debkafile. 21 May 2018. ^ "US-led coalition attacks some military positions in Deir Ezzor countryside". Syrian Arab News Agency. 24 May 2018. ^ "US denies involvement in Syria missile strike which kills 12". The Daily Telegraph. 24 May 2018. ^ "Report: Suspected Israeli strike targets Hezbollah in Syria". Ynet. 25 May 2018. ^ "Iran denies any of its troops killed in suspected Israeli strike in Syria". The Times of Israel. 26 May 2018. ^ "דיווח: 21 אנשי צבא נהרגו בתקיפה שלשום בסוריה - בהם 9 איראנים". Kan 11. 26 May 2018. ^ "מקורות באופוזיציה הסורית: ישראל תקפה שיירת חיזבאללה בדרכה ללבנון". Maariv. 26 May 2018. ^ a b c "דיווח: "מפקד בכיר בחיזבאללה נהרג בתקיפה ישראלית בסוריה"". Kan 11. 29 May 2018. ^ "Hezbollah men, including commander, said killed in Syria strike blamed on Israel". The Times of Israel. 29 May 2018. ^ "Israeli Airstrikes Hit Syrian Regime Positions In Bareda Area In Damascus Countryside". Qasioun News Agency. 31 May 2018. ^ "מקורות ערביים: ישראל תקפה מחסני נשק ותחמושת של חיזבאללה ליד דמשק. אין אישור". Debkafile. 31 May 2018. ^ "Massive explosion rocks east Aleppo airbase overnight, military denies Israeli airstrikes". Al-Masdar News. 3 June 2018. ^ "Syrian Media Claim Explosion Due to 'Overheating' at Weapons Depot". The Jewish Press. 5 June 2018. ^ "Report: Israeli Raids Hit Hizbullah Positions in Syria". Naharnet. 5 June 2018. ^ "Syrie: une série de déflagrations ont été retenties près de Damas". Press TV. 11 June 2018. ^ "Conflicting reports on the explosions hit the regime-run Arms depots of Qatifah". Syria Call. 11 June 2018. ^ "מפעל לייצור טילי קרקע-קרקע סוריים התפוצץ ליד העיר אל קוטייפה במזרח הרי קלמון ליד גבול סוריה-לבנון. המפעל נחרב". Debkafile. 11 June 2018. ^ "Une usine de missiles a explose en syrie pres de la frontiere syro-libanaise". Infos-Israel.News. 12 June 2018. ^ "ملخص دمشق و ريفها اليومي 14-6-2018". Step News Agency. 14 June 2018. ^ a b "جيش الاحتلال يدمر منظومات دفاع جوي لنظام الأسد بريف درعا". Shaam News Network. 15 June 2018. ^ "Israel targets Iran-affiliated missile system in south of Syria". Orient News. 16 June 2018. ^ "US-led coalition attacks a military position in the countryside of al-Boukamal". Syrian Arab News Agency. 18 June 2018. ^ "US-led coalition denies bombing pro-regime position in east Syria". i24NEWS. 18 June 2018. ^ "U.S. official to CNN: Israel behind strike on Syrian-Iraqi border". The Jerusalem Post. 18 June 2018. ^ "Syria, Iraq, says US-led strike hits troops in east, US denies". Syrian Observatory for Human Rights. 18 June 2018. ^ "Syria: 95 Iranian troops killed in US-led coalition airstrike in al-Hari – US denies". Behind the News. 18 June 2018. ^ a b "40 Hezbollah, Iranian Militiamen, Dead in Allied Attack at Syria-Iraq Border". The Jewish Press. 18 June 2018. ^ "IDF drone crashes in Syria". Ynet. 19 June 2018. ^ "IDF: Patriot missile fired at incoming UAV from Syria, which retreats". The Times of Israel. 24 June 2018. ^ "IDF fires Patriot missile toward UAV approaching Israel's Golan Heights". The Jerusalem Post. 24 June 2018. ^ "Two Israeli missiles land near Damascus International Airport". Syrian Arab News Agency. 26 June 2018. ^ "Israel reportedly struck Iranian cargo plane in Damascus". Al-Masdar News. 26 June 2018. ^ "Syrian media: two Israeli missiles strike near Damascus airport". The Jerusalem Post. 26 June 2018. ^ "عاجل يسرائيل هيوم: تقارير من سوريا تفيد بأن سلاح الجو الإسرائيلي قصف مطار ال T4 العسكري". Syrian News App. 28 June 2018. ^ "Israel shells Iranian militias near Syria's T4 airbase". The Baghdad Post. 29 June 2018. ^ "Syria: Arabs report Israeli fighter jets bombed the T4 base in Homs". Behind the News. 29 June 2018. ^ "Explosion reported at Iranian arms depot in Syria". Ynet. 3 July 2018. ^ "Blast reported at Syrian warehouse used by Iranian-backed militias". The Times of Israel. 3 July 2018. ^ "Iranian militias are crossing the "red lines" and are roaming in Daraa city and approaching Jordanian border". Nabaa Media Foundation. 3 July 2018. ^ "Report: Israel attacked weapon depots belonging to Assad regime, militias". The Jerusalem Post. 3 July 2018. ^ "Blast Reported at Syria Warehouse Used by Iran-Backed Militias". Algemeiner Journal. 3 July 2018. ^ "IDF strikes Syrian regime post after mortar lands in buffer zone". Jerusalem Post. 6 July 2018. ^ "غارات إسرائيلية ضد قافلة إيرانية ومقتل العشرات من الميليشيات الإيرانية وحزب الله جنوب سوريا". The Baghdad Post. 7 July 2018. ^ "SYRIAN TV: ISRAEL RESPONSIBLE FOR AIR STRIKES ON T-4 MILITARY BASE IN HOMS". The Jerusalem Post. 8 July 2018. ^ "مصادر: 9 قتلى للنظام بالقصف الجوي الإسرائيلي على مطار التيفور". Al Jisr TV. 9 July 2018. ^ "IDF SPOKESPERSON: PATRIOT MISSILE LAUNCHED AGAINST SYRIAN DRONE". Jerusalem Post. 11 July 2018. ^ "New Israeli aggression on military posts in Quneitra countryside". Syrian Arab News Agency. 12 July 2018. ^ "IDF attacks Syrian military posts". Arutz Sheva. 12 July 2018. ^ "פרסום ראשון: צה"ל תקף אמצעי תצפית איראניים בסוריה". Kan 11. 12 July 2018. ^ a b "مصادر تكشف لأورينت خسائر الميليشيات الإيرانية بالقصف الإسرائيلي في القنيطرة". Orient News. 12 July 2018. ^ "ISRAEL FIRES PATRIOT MISSILE AGAINST DRONE ON SYRIAN BORDER". Jerusalem Post. 13 July 2018. ^ "Israeli Occupation Shoot Down A Drone Approached Occupied Golan". Qasioun News Agency. 13 July 2018. ^ "Report: IAF attacked a Syrian military outpost near Aleppo". The Jerusalem Post. 15 July 2018. ^ a b "Strikes blamed on Israel killed 9 pro-regime fighters in Syria". Syrian Observatory for Human Rights. 16 July 2018. ^ a b "Report: 22 Killed in Israeli Missile Attack on Iranian Revolutionary Guard near Aleppo". The Jewish Press. 16 July 2018. ^ "Rocket sirens heard in Golan Heights". The Jerusalem Post. 18 July 2018. ^ "Golan Heights rocket sirens a false alarm, IDF says". The Jerusalem Post. 18 July 2018. ^ "Israeli aggression targets military site in Masyaf area". Syrian Arab News Agency. 22 July 2018. ^ "Israeli Jets Hit Iranian Target in Syria". Syrian Observatory for Human Rights. 22 July 2018. ^ "Israeli Air-defenses Activated After Syrian Missiles Detected Heading Into Israeli Territory". Haaretz. 23 July 2018. ^ "Israel downs Syrian fighter jet with Patriot missiles". The Jerusalem Post. 24 July 2018. ^ "IDF shoots down Syrian fighter jet that entered Israeli airspace". The Times of Israel. 24 July 2018. ^ ""ידענו שלא מדובר במטוס קרב רוסי"". Mako. 24 July 2018. ^ "Suspected ISIS rockets hit Sea of Galilee; IDF destroys launcher in Syria". Israel Hayom. 26 July 2018. ^ "Islamic State fired at Israel in bid to draw it into Syria, says ex-intel chief". The Times of Israel. 27 July 2018. ^ "2 Syrian rockets said to land in Sea of Galilee, near crowded tourist beach". Times of Israel. 25 July 2018. ^ "طائرة اسرائيلية تقصف منصة صواريخ جنوبي سوريا". SMART News Agency. 26 July 2018. ^ "إسرائيل تستهدف مواقع عسكرية للجيش السوري في ريف القنيطرة والدفاعات الجوية ترد". Sputnik. 25 July 2018. ^ "Moscow thanks IDF for hitting launcher in Syria, says IS tried to provoke Israel". The Times of Israel. 26 July 2018. ^ "Israel says it killed seven insurgents on Syria frontier, talks up Assad". Reuters. 2 August 2018. ^ "IDF opens fire at gunmen approaching border fence from Syria". The Times of Israel. 24 December 2018. ^ "Iron Dome deployed near Tel Aviv, IDF forces fired on Syria". The Jerusalem Post. 24 January 2019. ^ Satellite images show Iran missile factory in Syria destroyed by Israel air strikes. ^ Ravid, Barak (12 November 2012). "Netanyahu says Israel to determine if Syrian mortar fire was intentional". Haaretz. ^ AFP (6 January 2013). "Israel to fortify Syria border fence". NOW News. Retrieved 7 January 2013. ^ ""צבאית אנחנו בלתי מנוצחים": גדי איזנקוט בראיון מיוחד למעריב". Maariv. 30 March 2018. ^ "IAF commander: Israel still striking targets in Syria". The Jerusalem Post. 22 May 2018. ^ "Putin Says Israel Didn't Down Russian Aircraft; Netanyahu Offers Condolences". Haaretz. 18 September 2018. ^ Zitun, Yoav (13 November 2012). "Syria pledges to halt fire on Israel". Ynet. ^ Kais, Roi (12 November 2012). "Rebels warn Israel against Syria interference". Ynet.